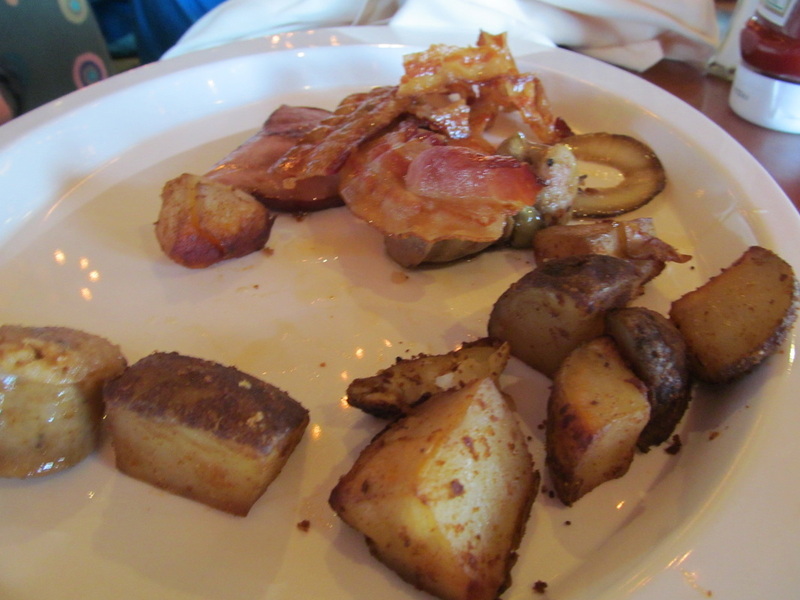 Once again, I ate breakfast at Tiffany's on the Lido Deck. 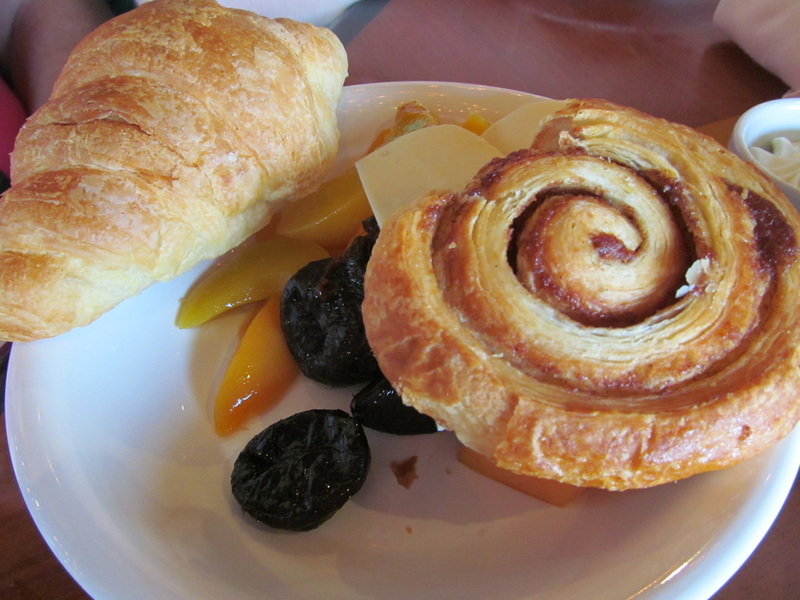 The continental breakfast buffet line opened at 6:30am and the regular breakfast buffet lines opened at 7:00am. 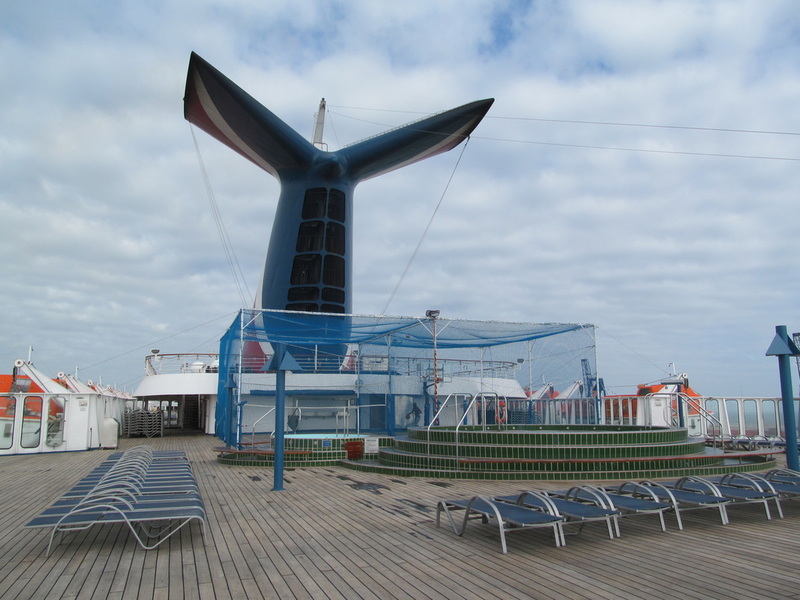 For cruisers that did not want to eat at Tiffany's the Imagination Dining Room hosted Open Seating from 7:30am - 9:30am. 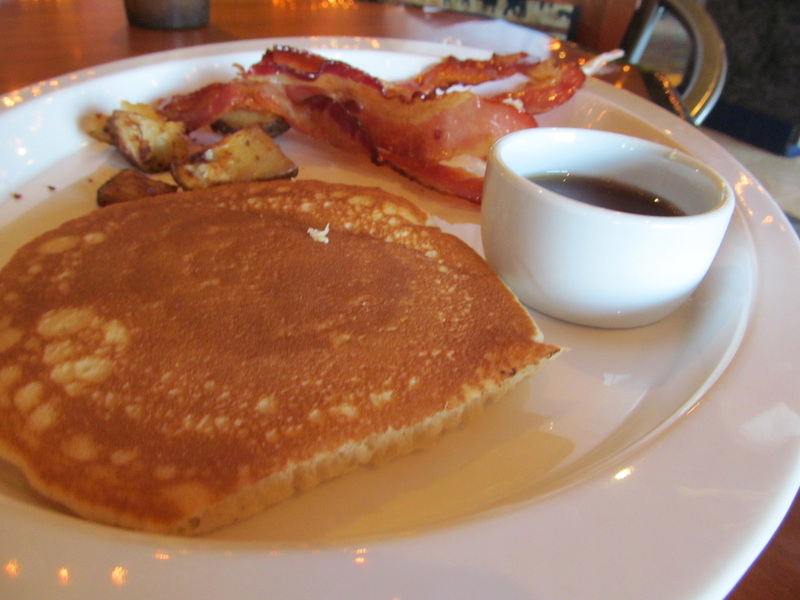 Today, instead of french toast, pancakes were served. 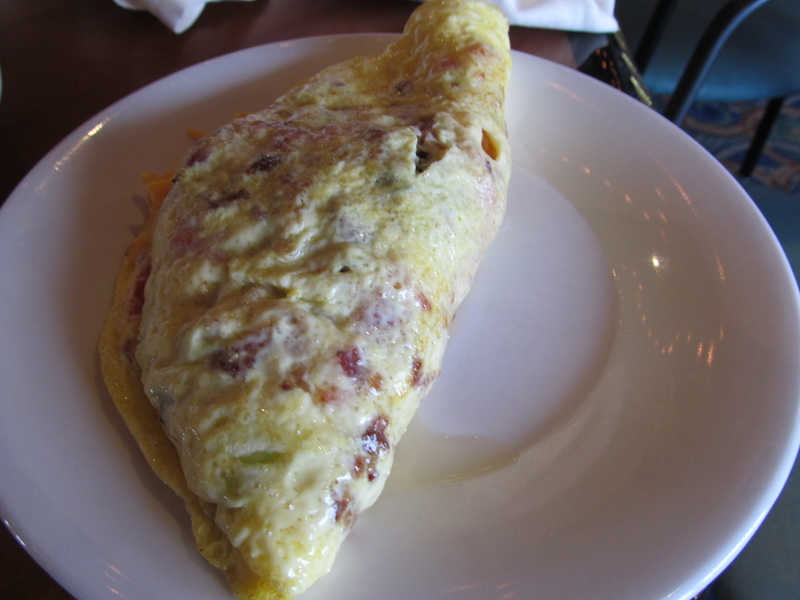 I went through the general breakfast buffet first to get some bacon, sausage, eggs, and potatoes, but then afterwards went to the deli to get my daily omelet. 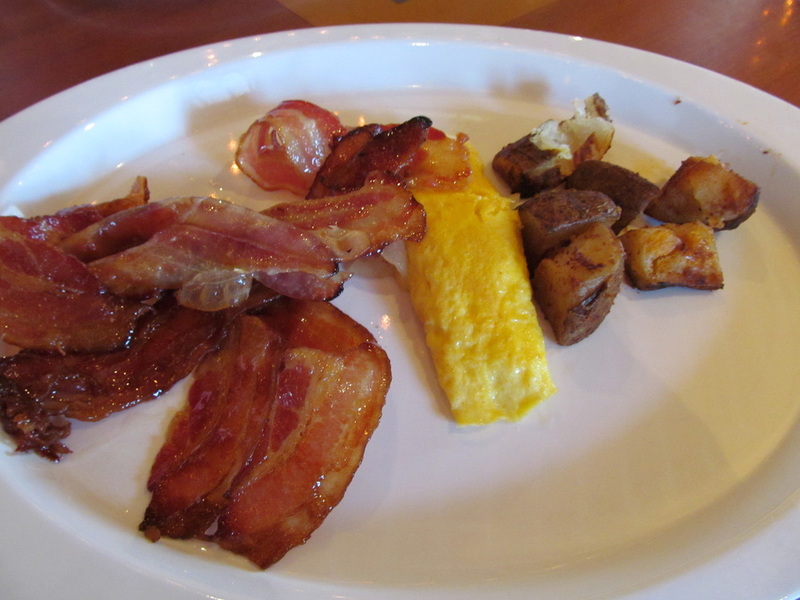 The food was all good, but most of the breakfast foods are very greasy. 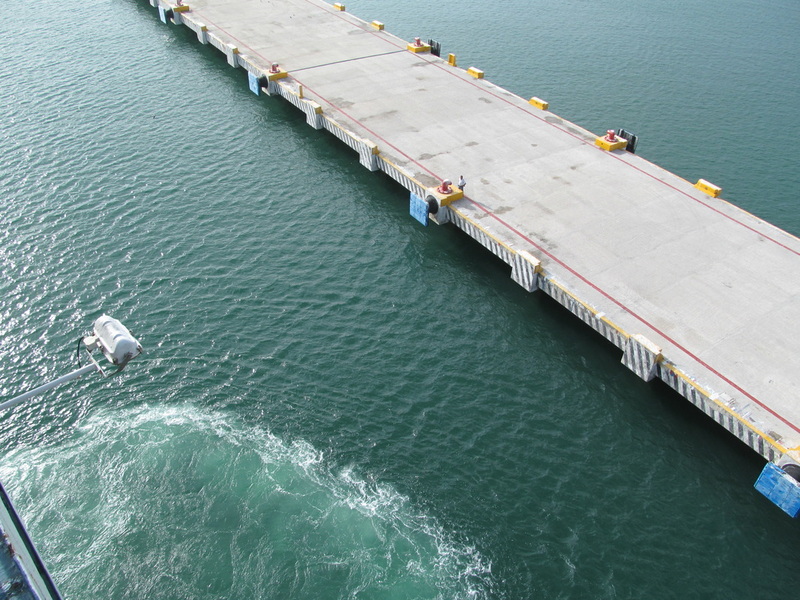 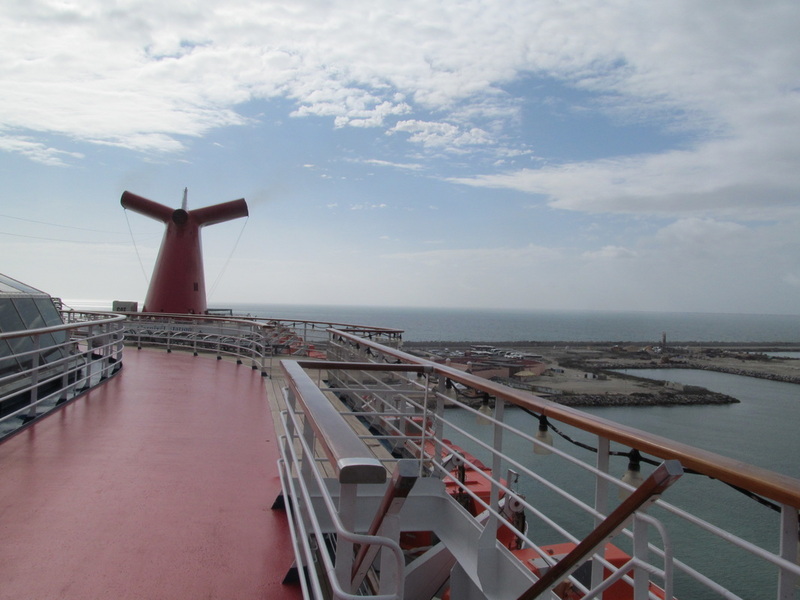 Due to the bad weather and choppy seas from the night before, the Carnival Elation was late arriving in Progreso by 40 minutes. 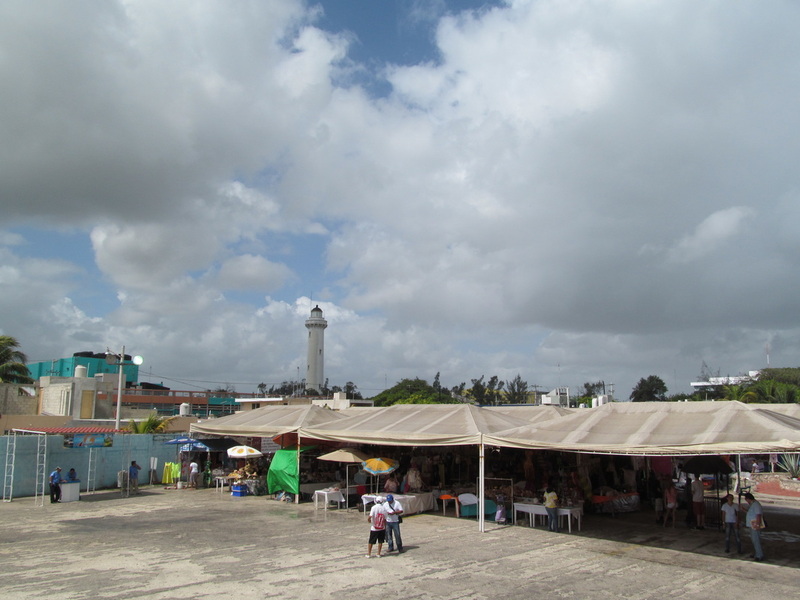 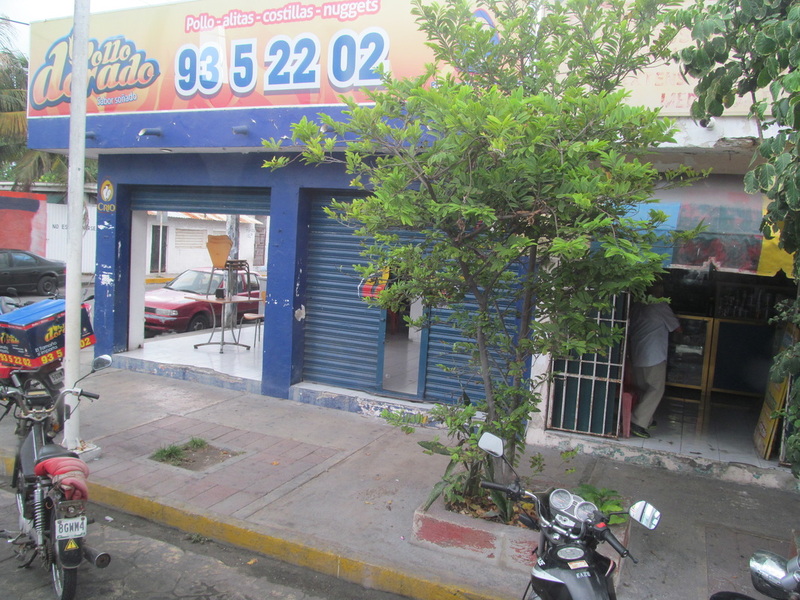 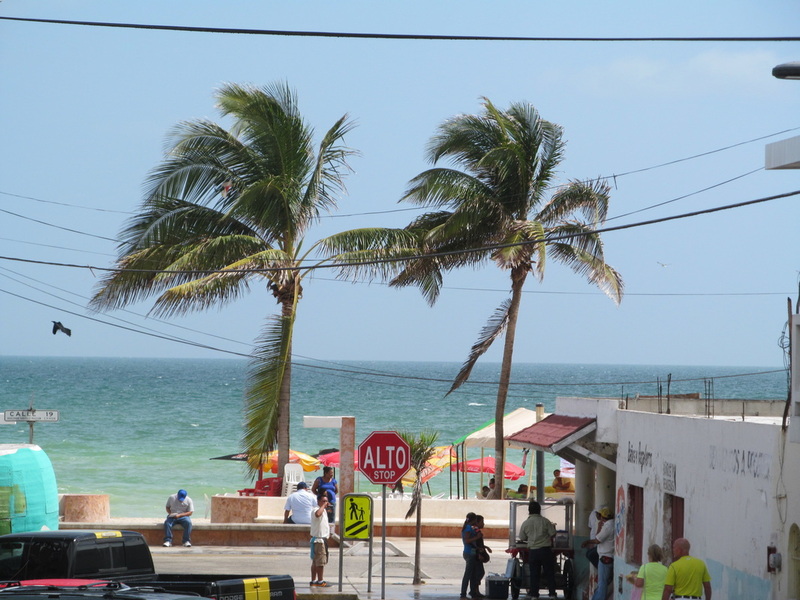 We arrived in Progreso at 8:40am instead of the scheduled time of 8:00am. 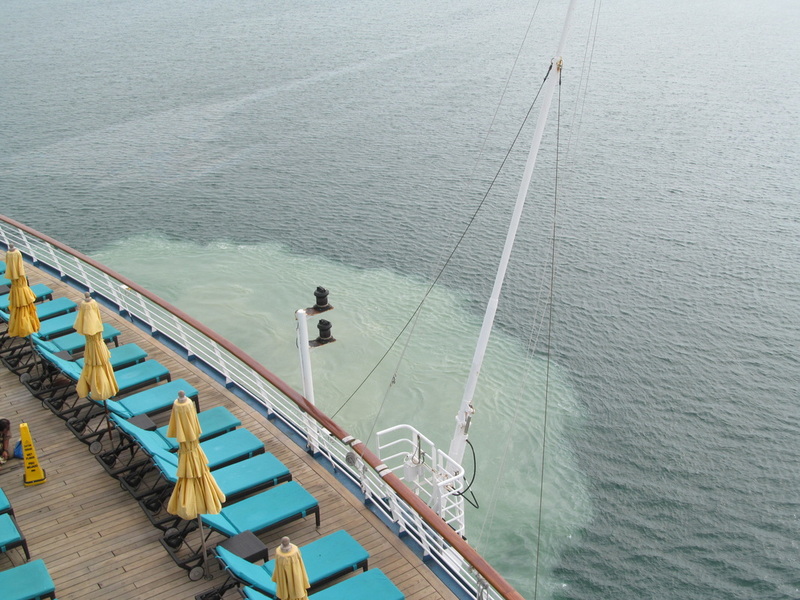 Our captain was kind enough to push back our time to set sail to 7:40pm. 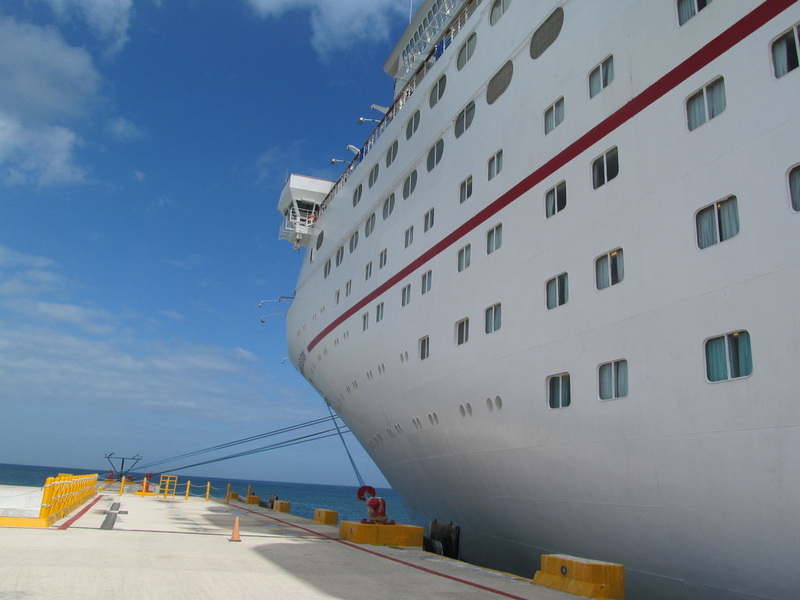 Before we could dock, the ship's captain turned the ship around to dock backwards. 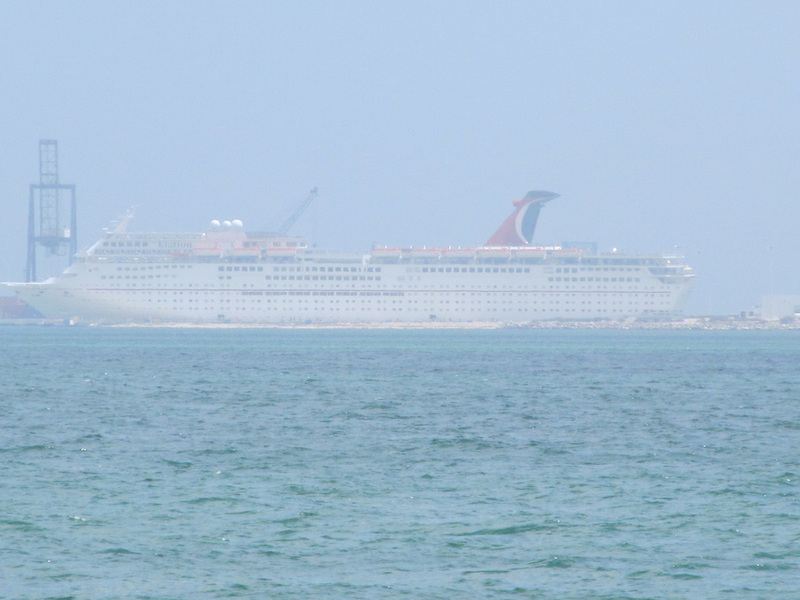 In Progreso cruise ships dock about 4 miles out from the mainland. 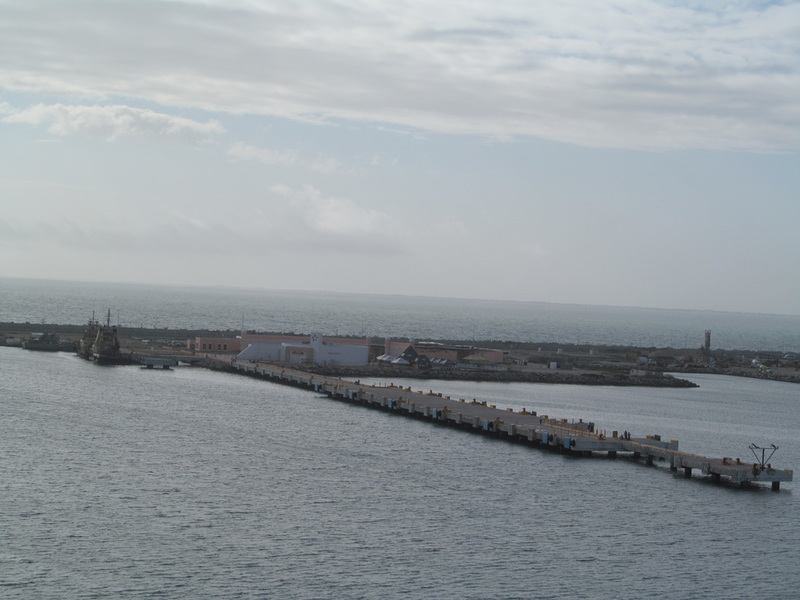 The pier cruise ships use is connected to a larger pier that extends over four miles long. 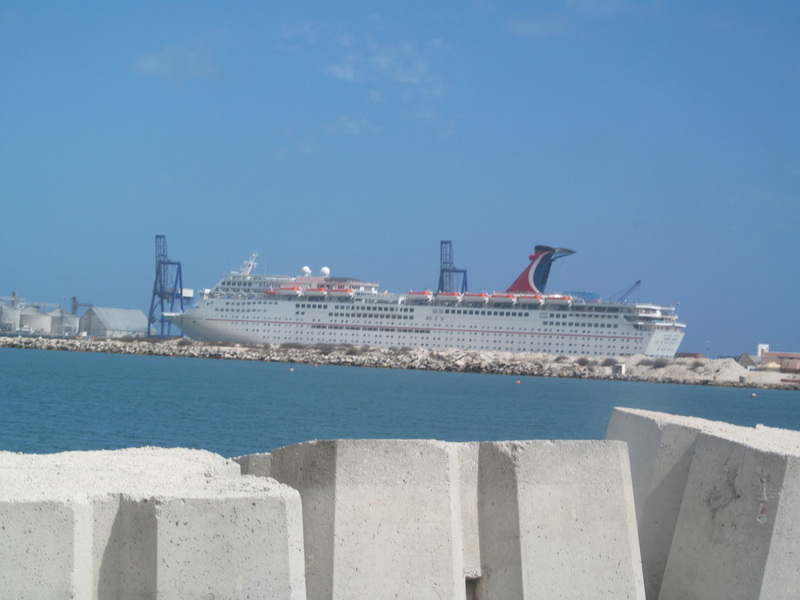 The leg of this long pier where cruise ships dock is close to the end of the long highway pier. 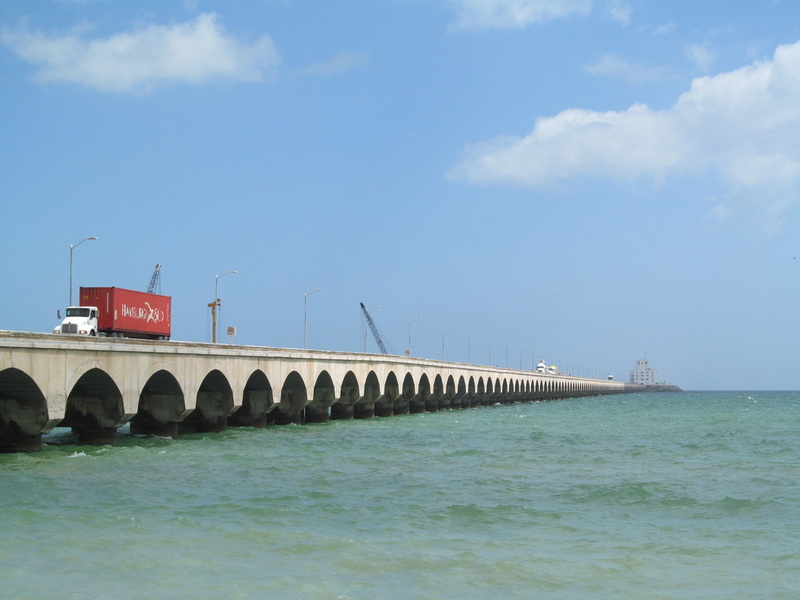 At the end of the long highway pier is a dock for cargo ships that contains cranes to unload shipping containers. 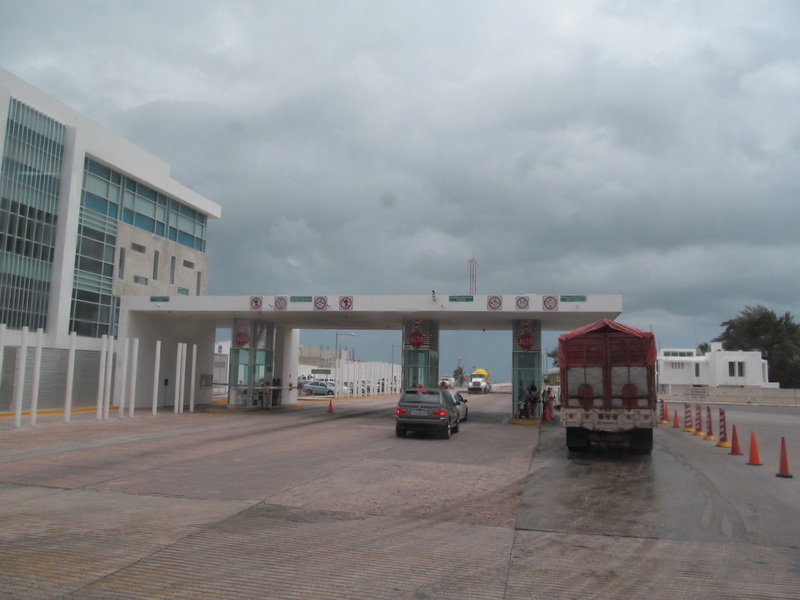 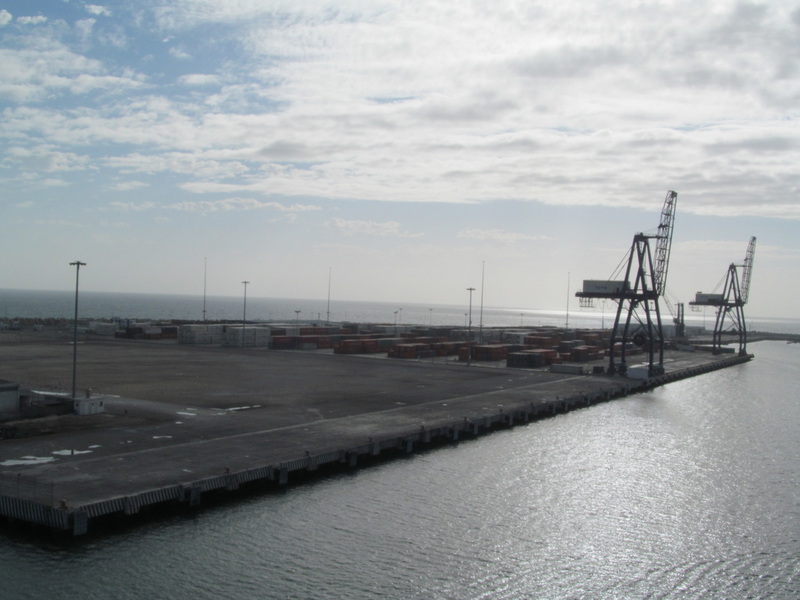 The four mile highway pier is constantly being used by large trucks to bring containers to the mainland, but on days cruise ships are docked will have buses running to transport cruise passengers to the mainland. 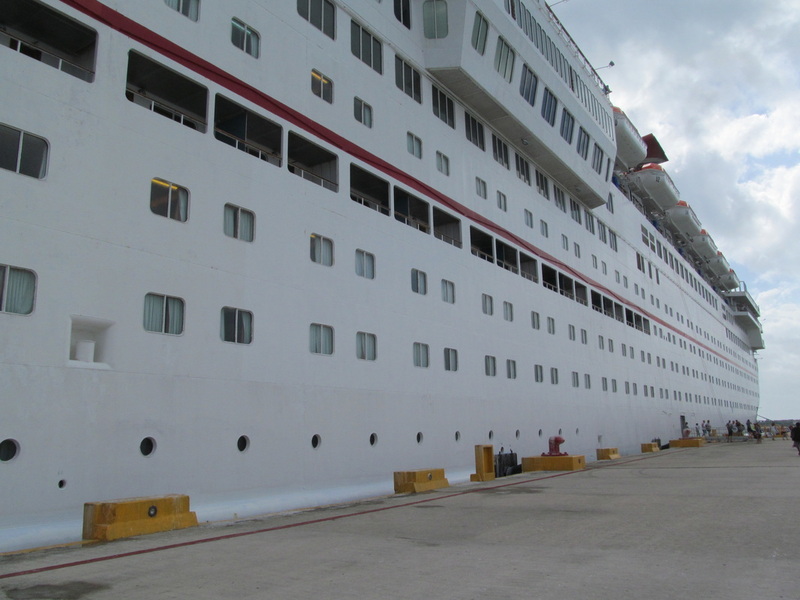 After we docked, I took a walk towards the front of the ship. 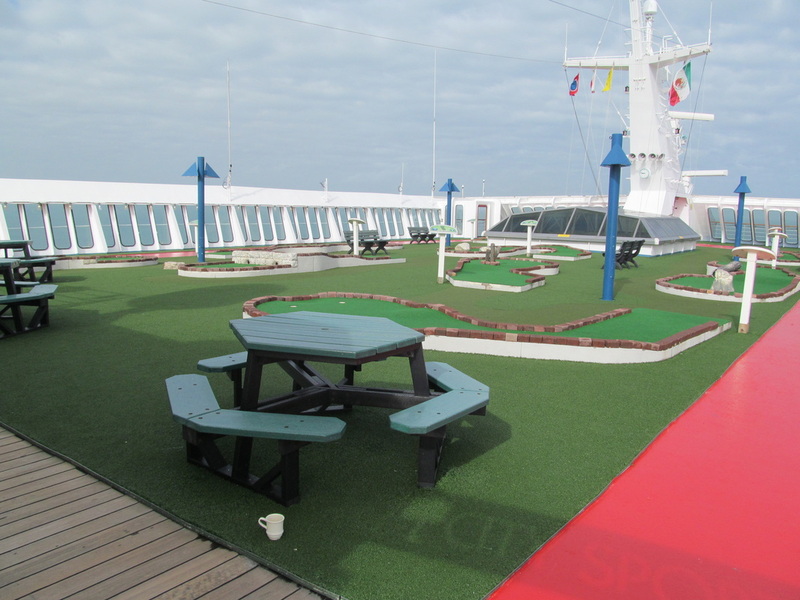 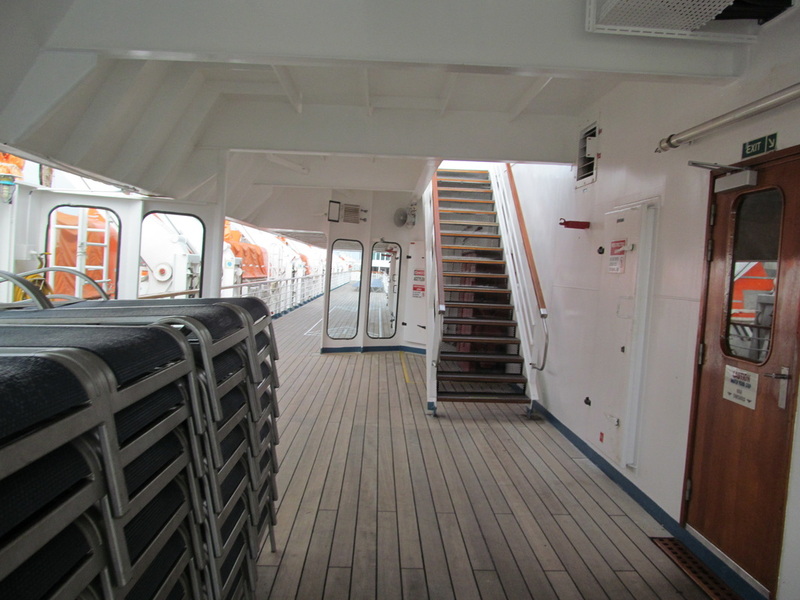 Most of the ship's public outside decks were empty because many cruisers were waiting to go ashore or eating breakfast. 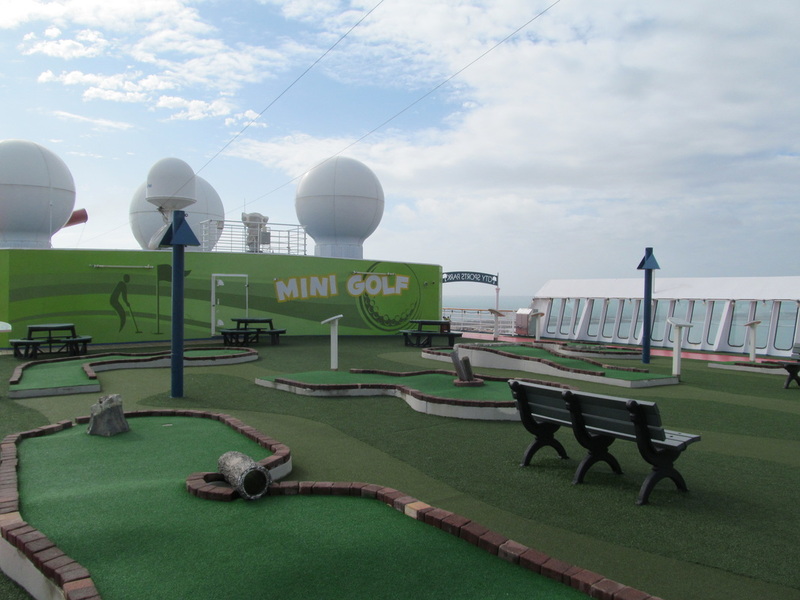 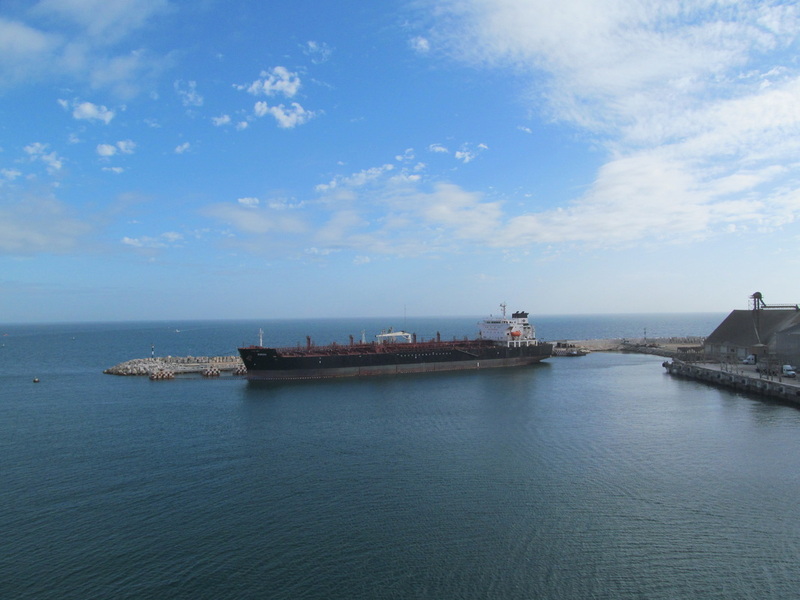 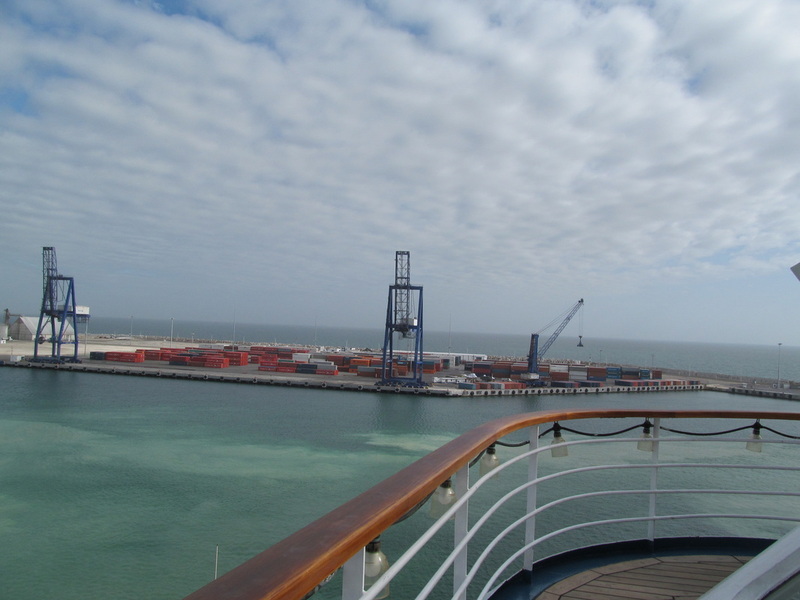 The front of the ship did not offer a great view, but it was nice seeing the Gulf of Mexico located to the north of Progreso. 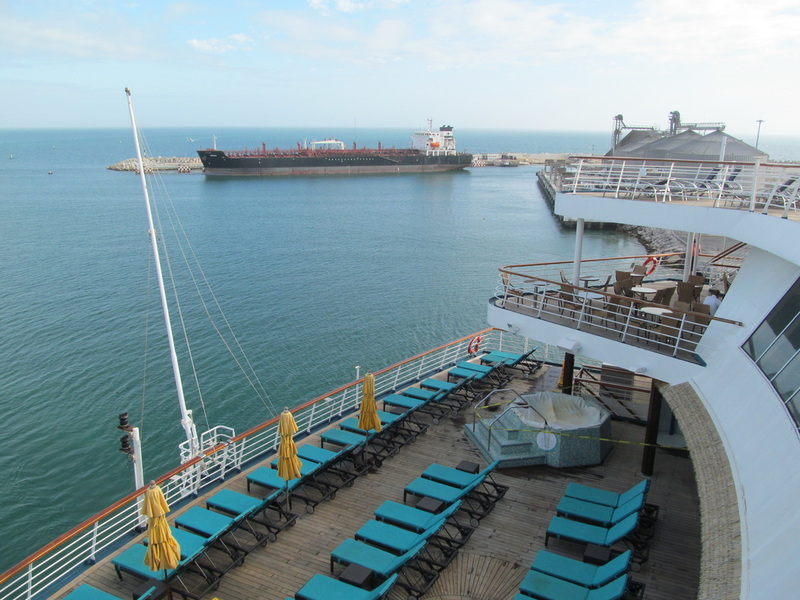 I thought the Carnival Elation was going to be the only ship docking in Progreso, but I would later be surprised when the Pullmantur Monarch arrived to dock with us (this was the same ship that was docked at a different pier the day before in Cozumel). 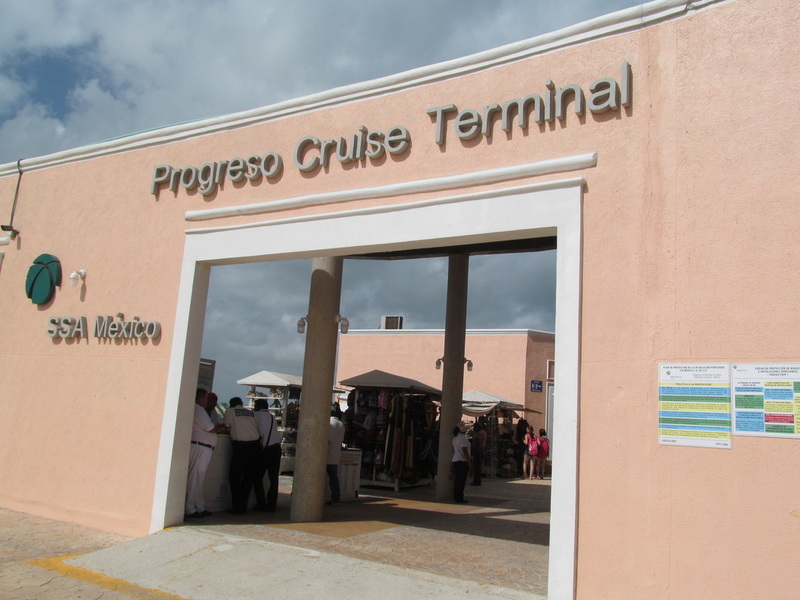 Getting Off The Ship to Visit Progreso: Getting off the ship to go ashore in Progreso was very easy. 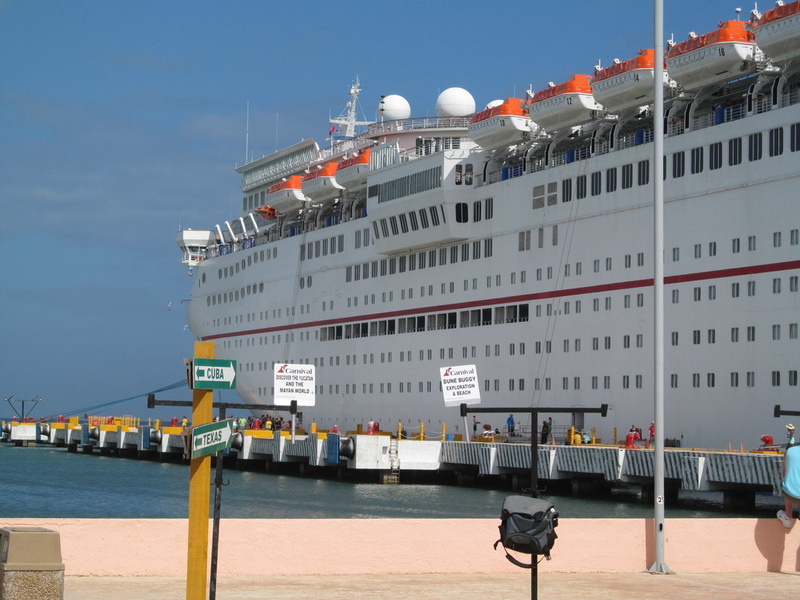 There was no line at the gangway because most cruisers were already off to go on a shore excursion and some cruisers were still eating breakfast. 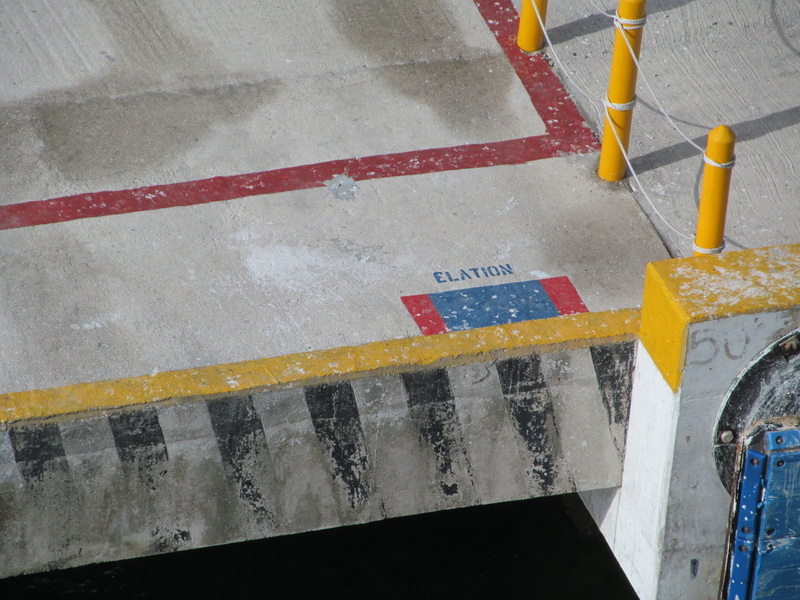 After getting our Sail & Sign cards scanned to get off we were directed down the gangway. 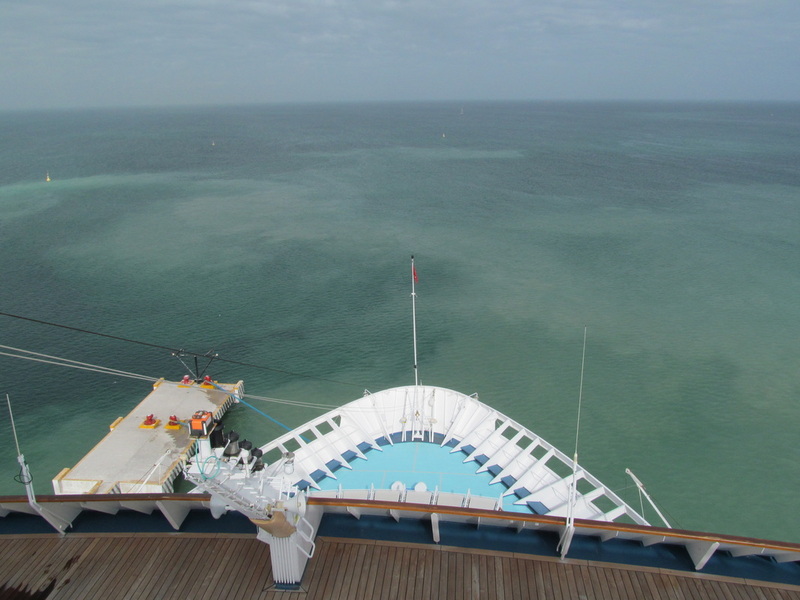 The ship's photographers were waiting to take photos, but we respectfully declined. 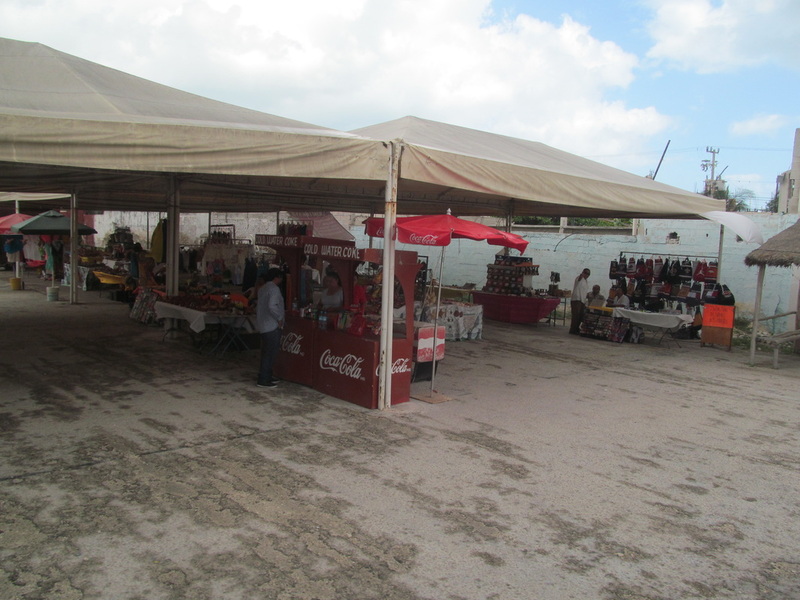 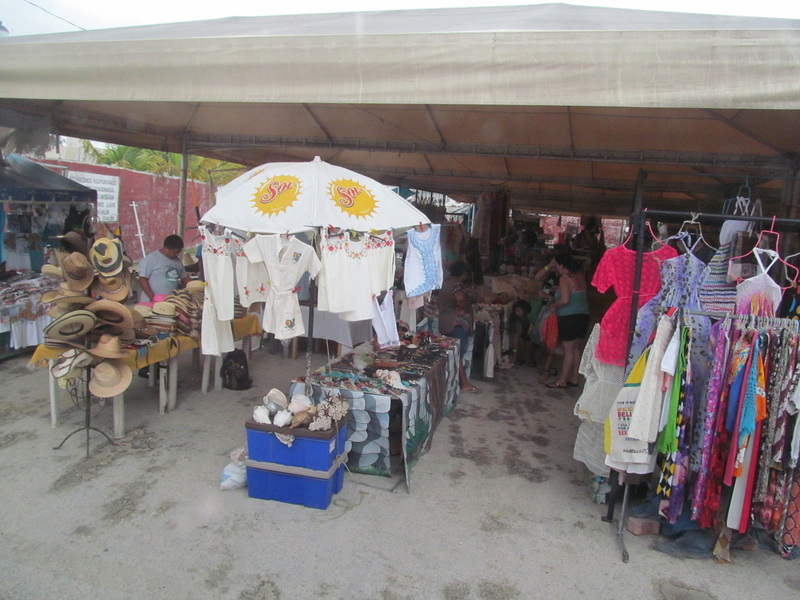 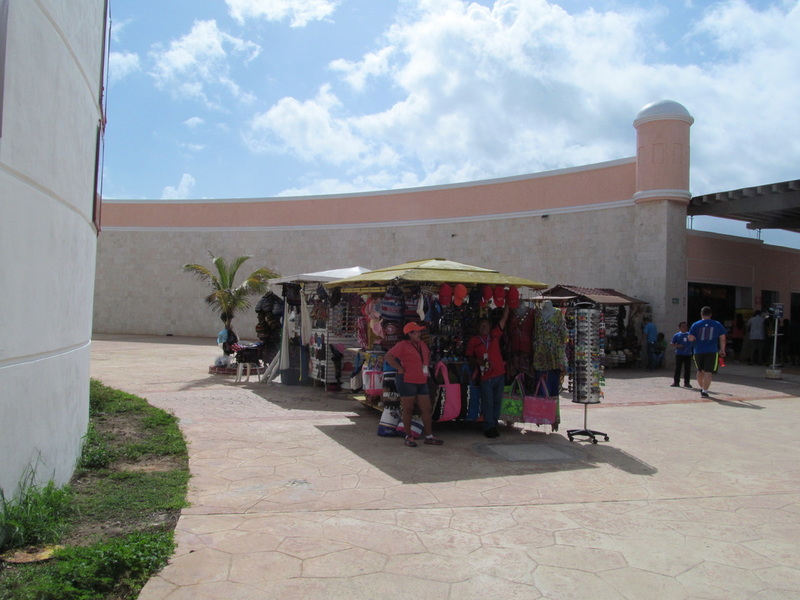 Due to the cruise ship dock being about four miles away from the mainland, there are many shops located near the cruise ship for cruisers that do not want to travel to the mainland. 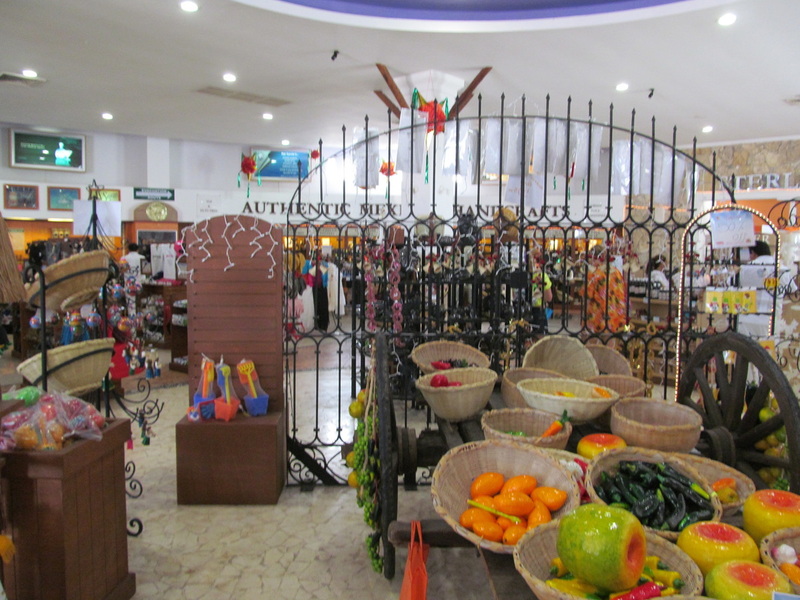 There is also a bar and restaurant located next to the shops. 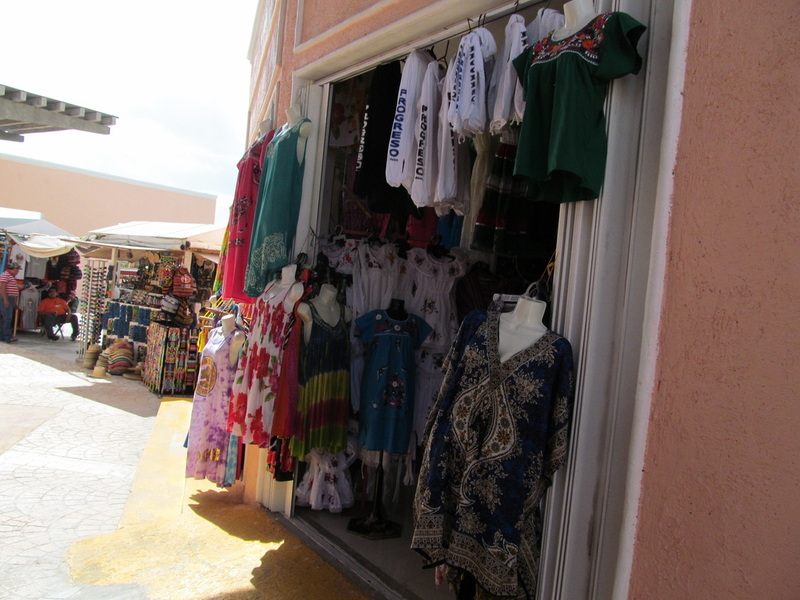 The Last Few Shops Before We Exited! 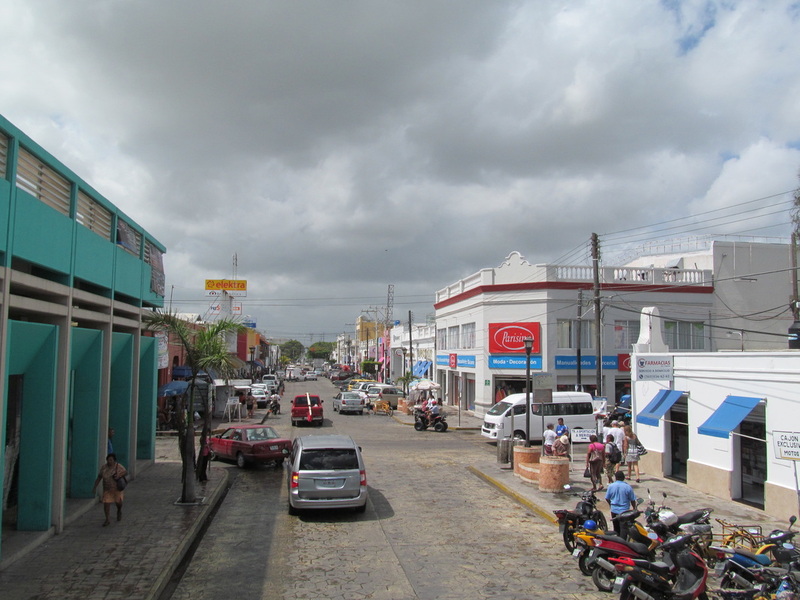 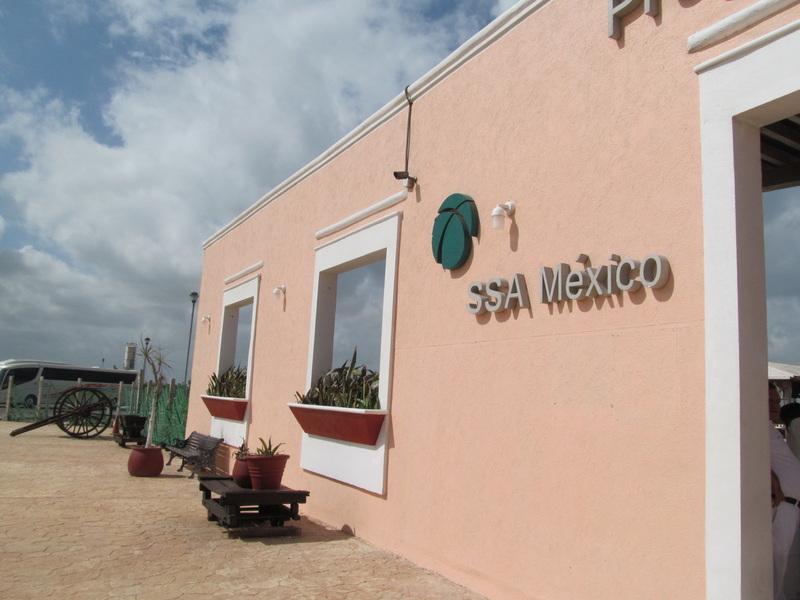 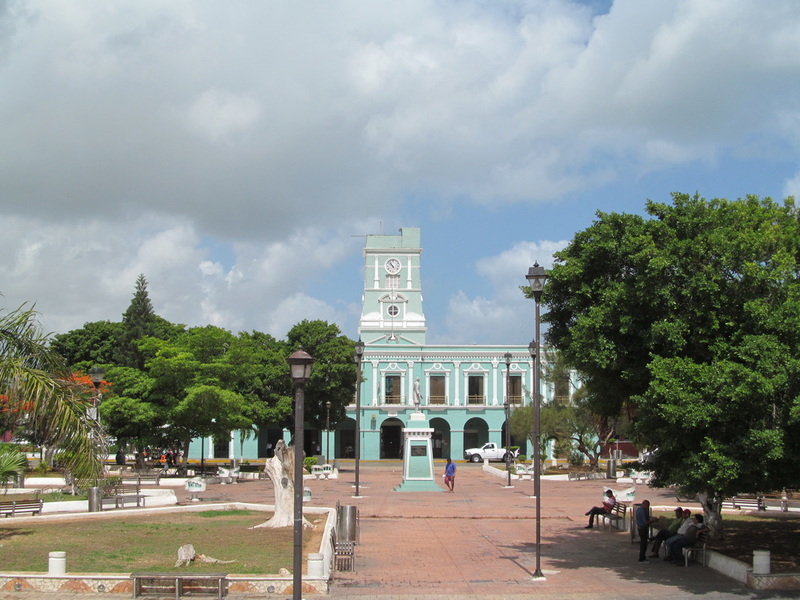 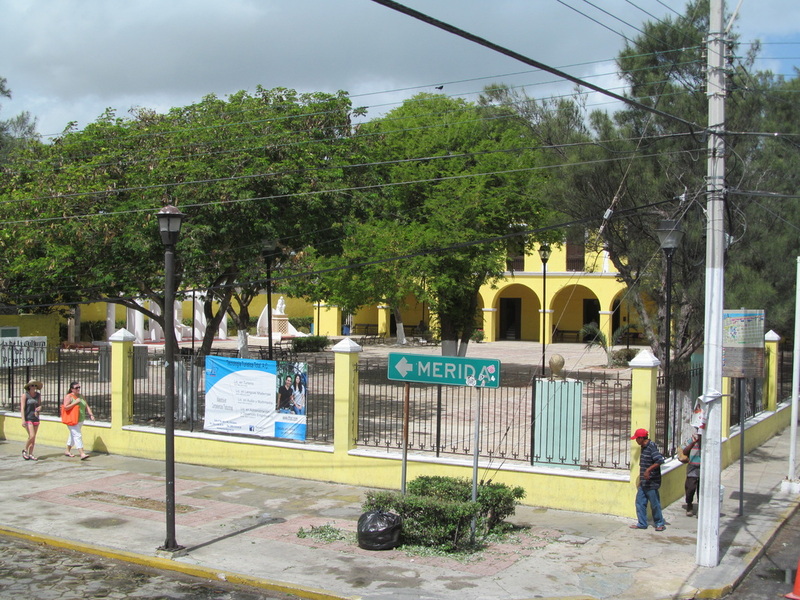 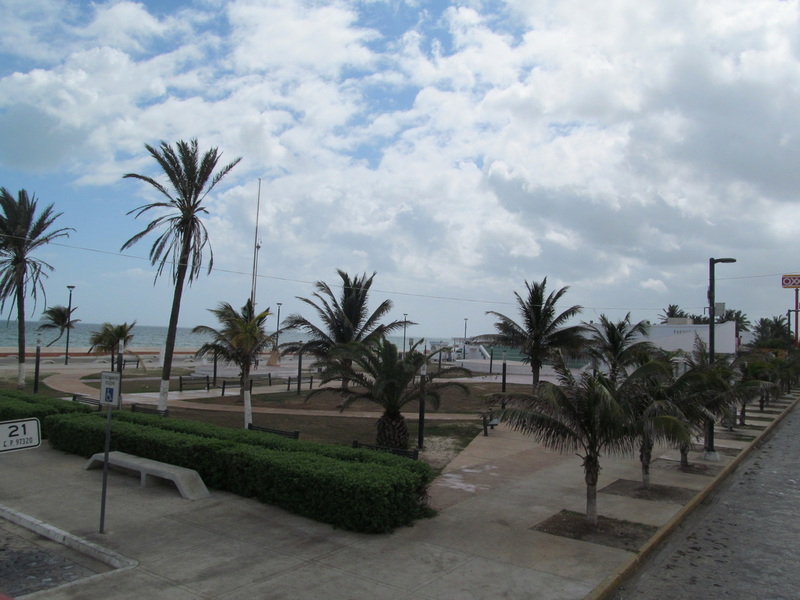 There is a free shuttle that departs every 20 minutes that will take cruisers to Downtown Progreso. 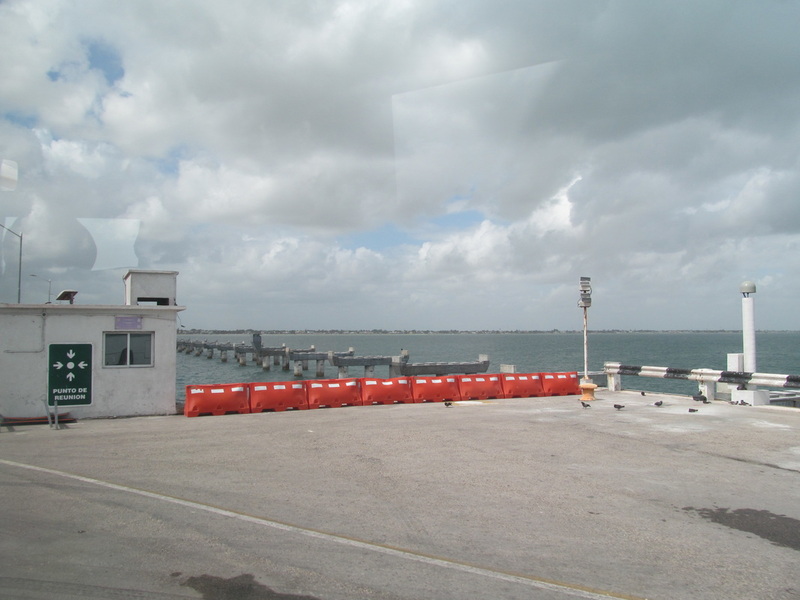 When we got to the area of the shuttle's departure we missed the last shuttle by about 30 seconds. 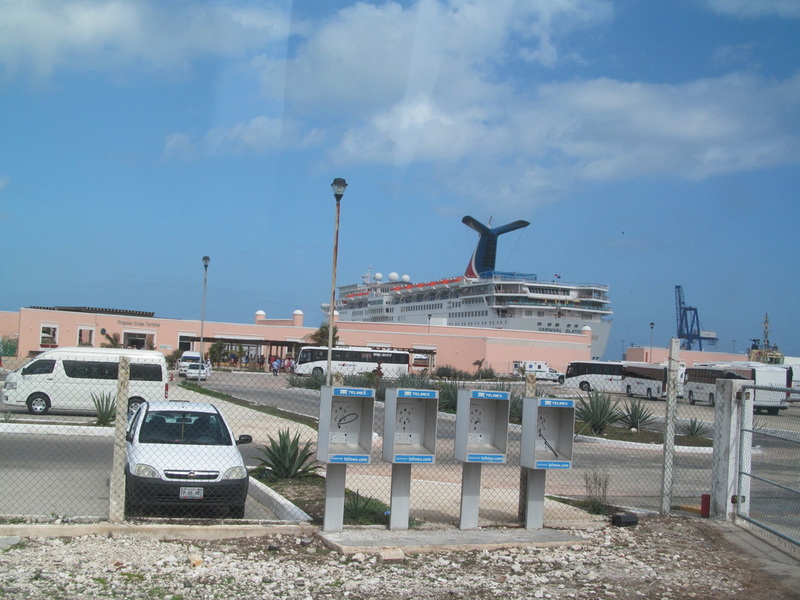 This meant we had to wait for the next shuttle to arrive. 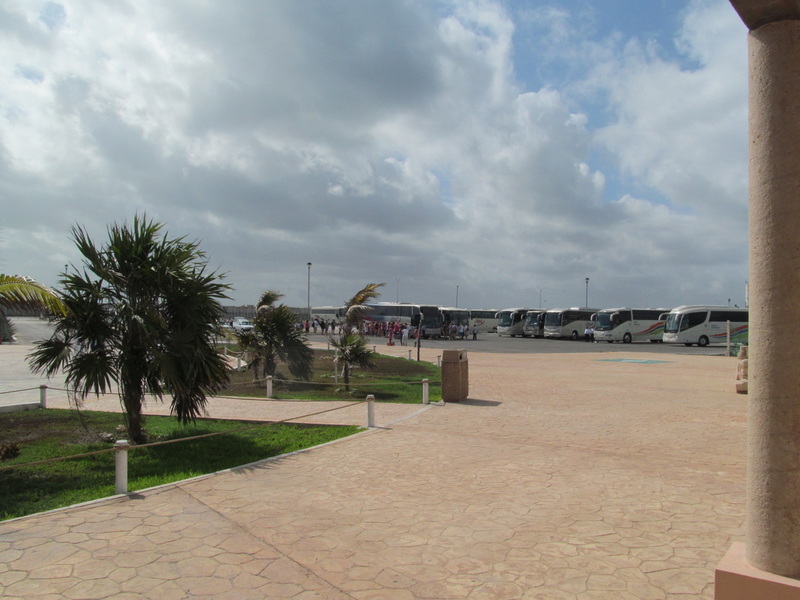 Thankfully, the shuttle arrived within 5 minutes for us to board, but it did not depart for another 15 minutes. 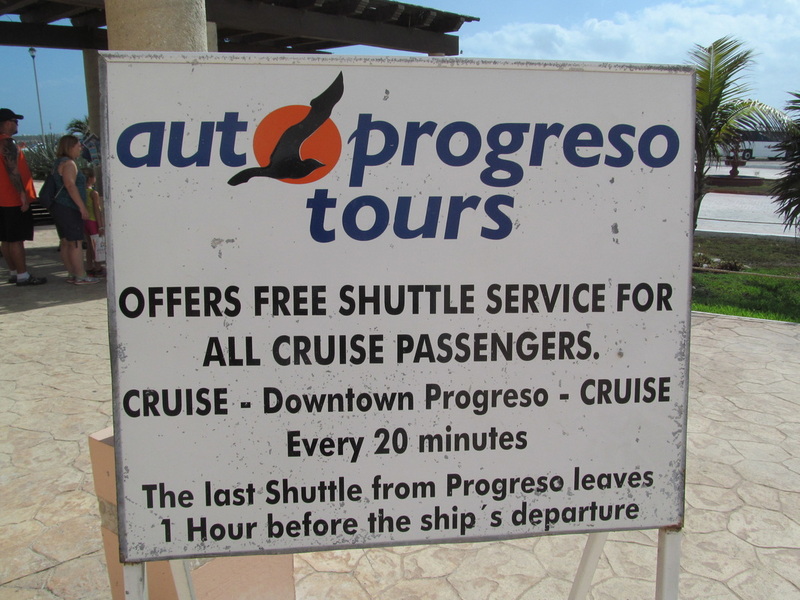 Before the shuttle bus departed an excursion salesperson that worked for Aut Progreso boarded to talk for the entire journey down the pier. 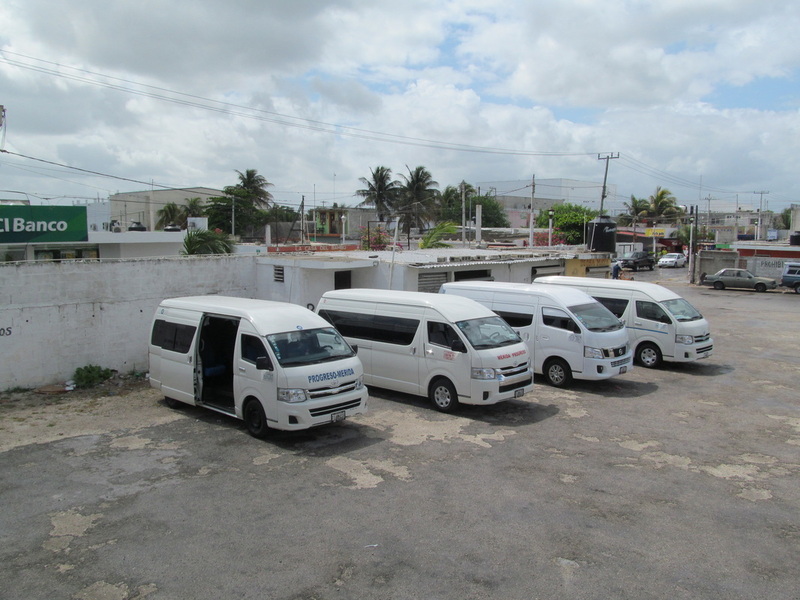 He was selling shore excursion tickets through his company and was hoping to get his captive bus audience to buy the excursions. 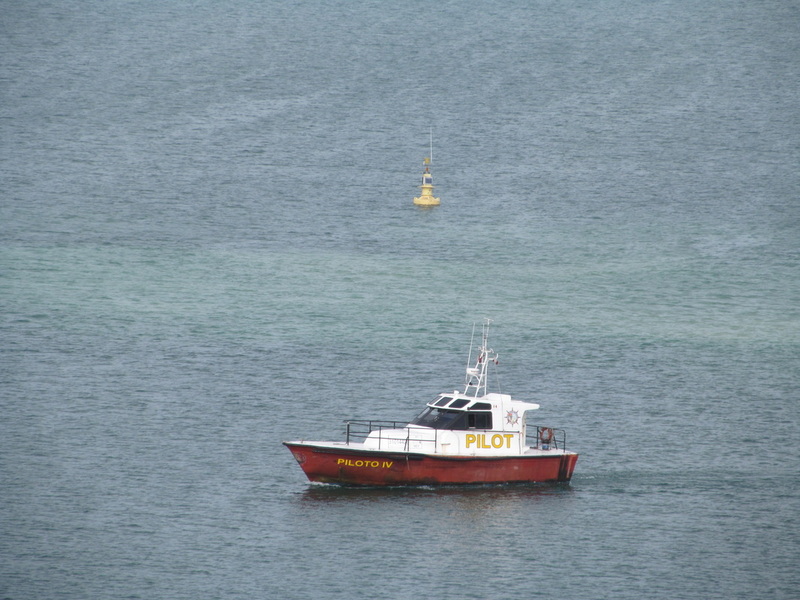 I tuned him out because I wanted to look outside and take some pictures. 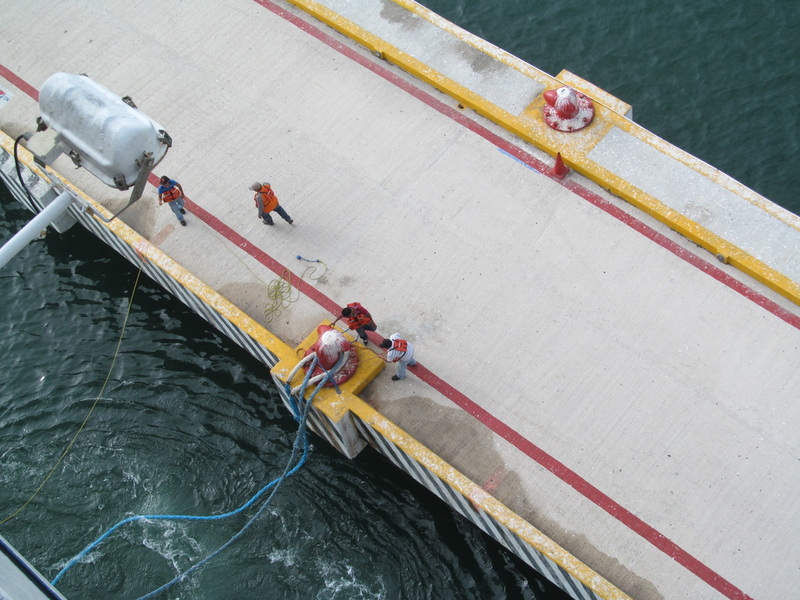 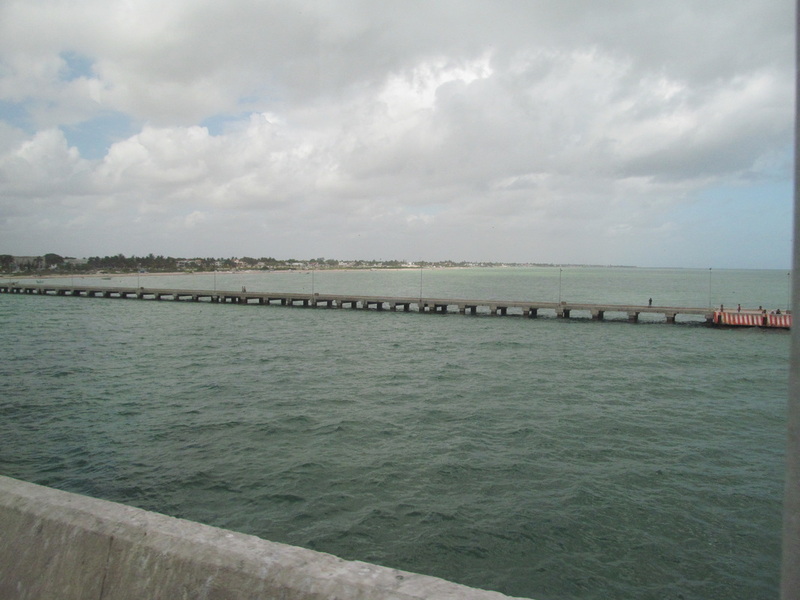 The entire four miles down the pier was very industrial, but I had a great view of the waters of the Gulf of Mexico. 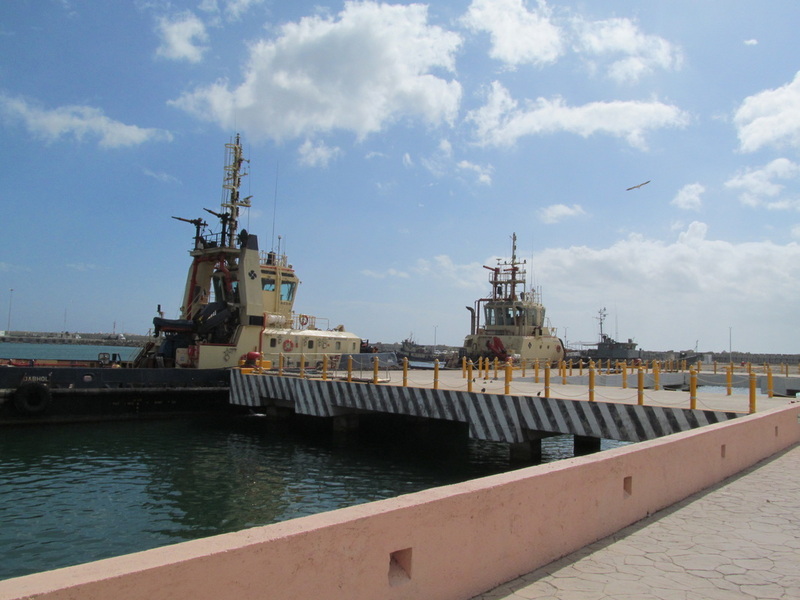 There was other traffic on the pier, but most of it was large trucks moving cargo. 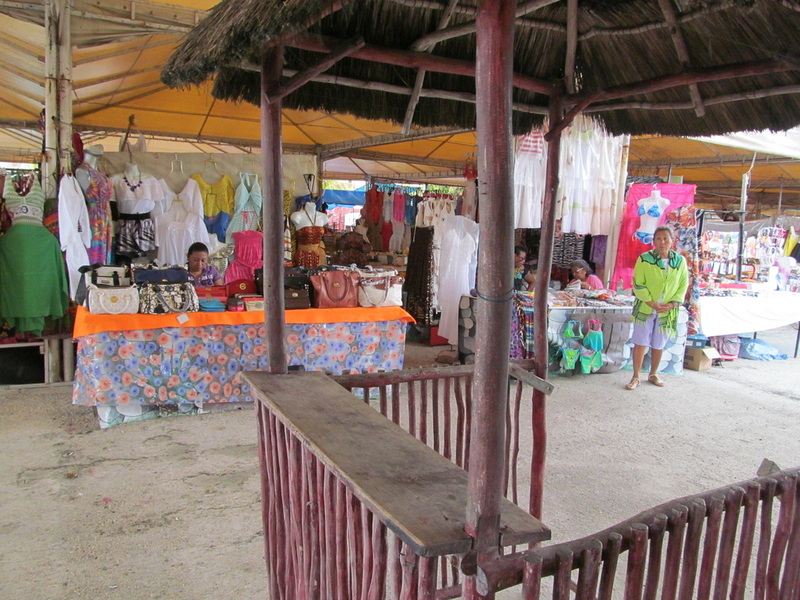 After our four mile journey on the pier to get to the mainland we were dropped off at a run down shopping area. 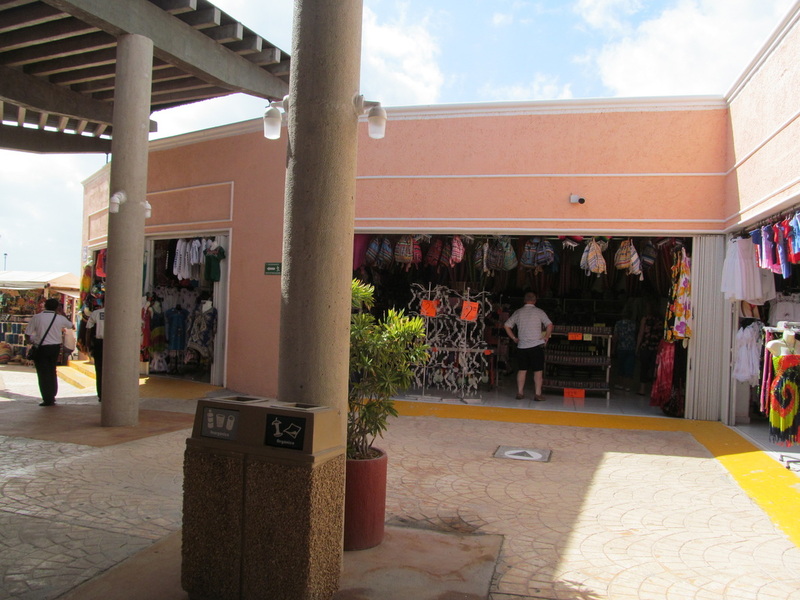 The people working these shops were just as annoying as in Cozumel, but after being bamboozled in Cozumel we did not look at any items. 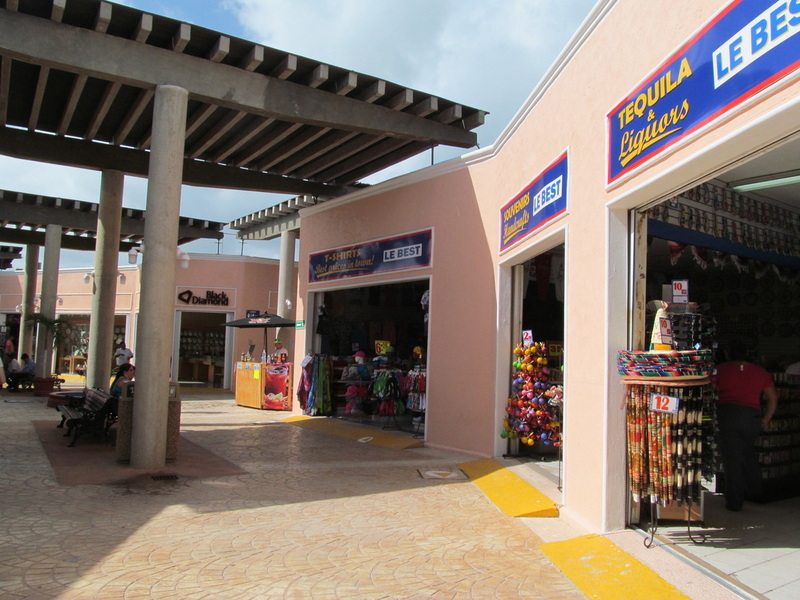 I used the phrase, "I spend all my money in Cozumel yesterday" or "I forgot my wallet on the ship" to avoid having to listen to the shopkeeper's pleas to look at their stuff. 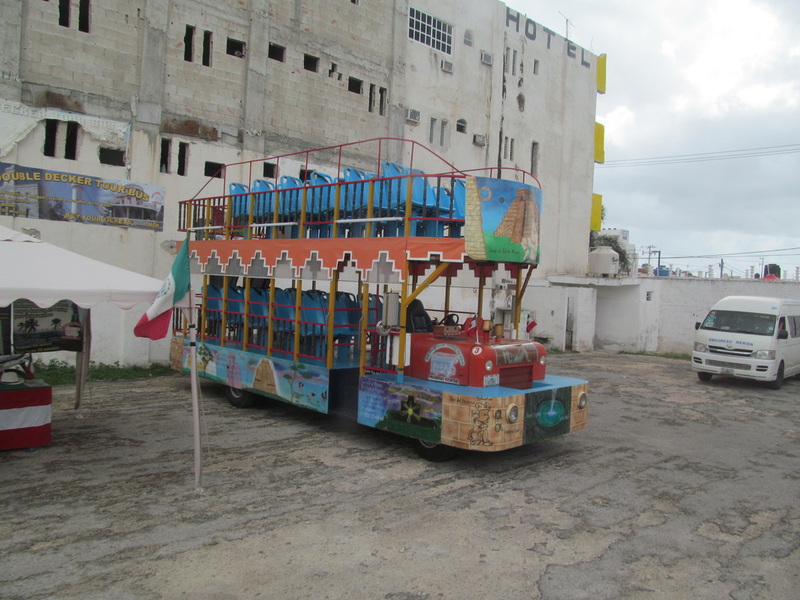 We paid to ride a two story bus around Progreso. 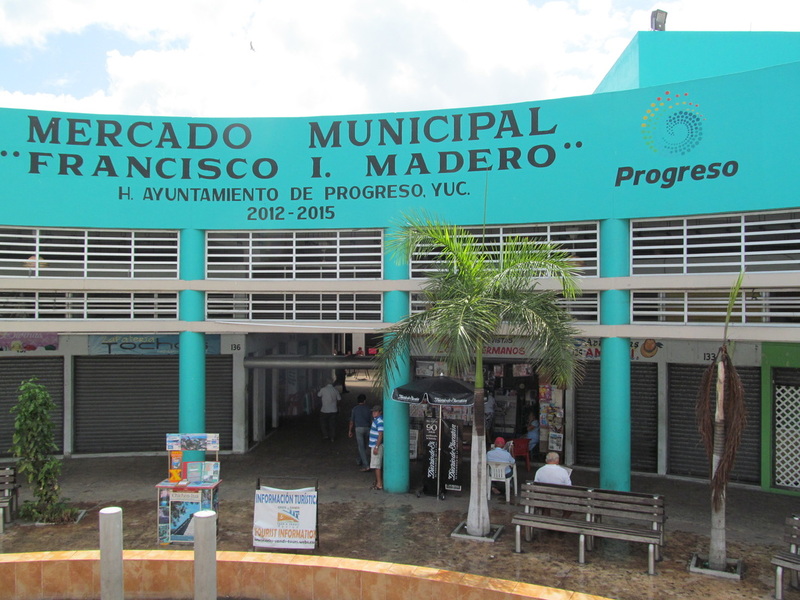 The ticket station to purchase this bus ride was located in the same area where the free shuttle dropped us off. 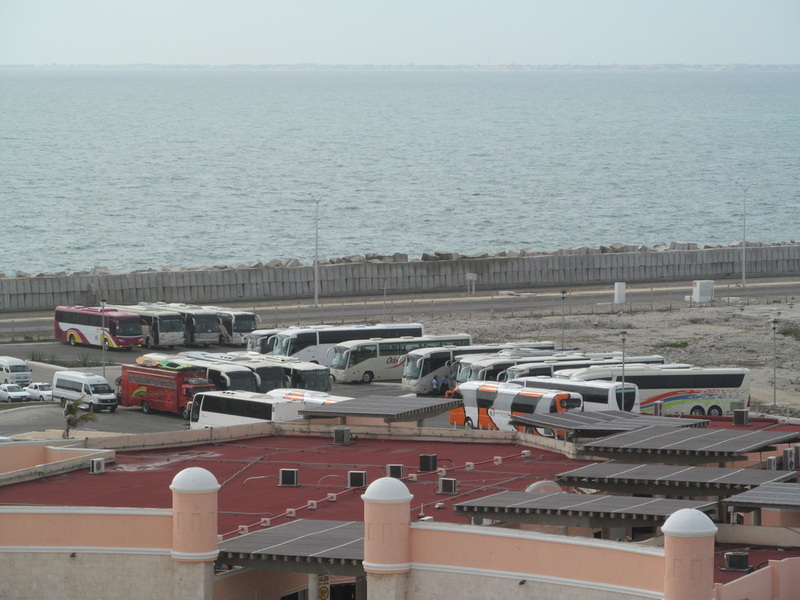 Each bus ticket was $5.00. 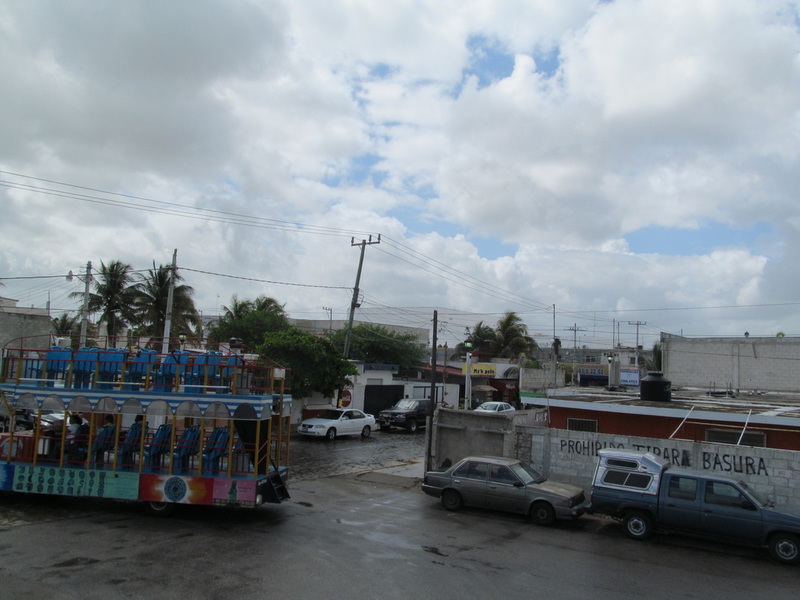 We wanted to ride on the top of the bus to get the best view possible. 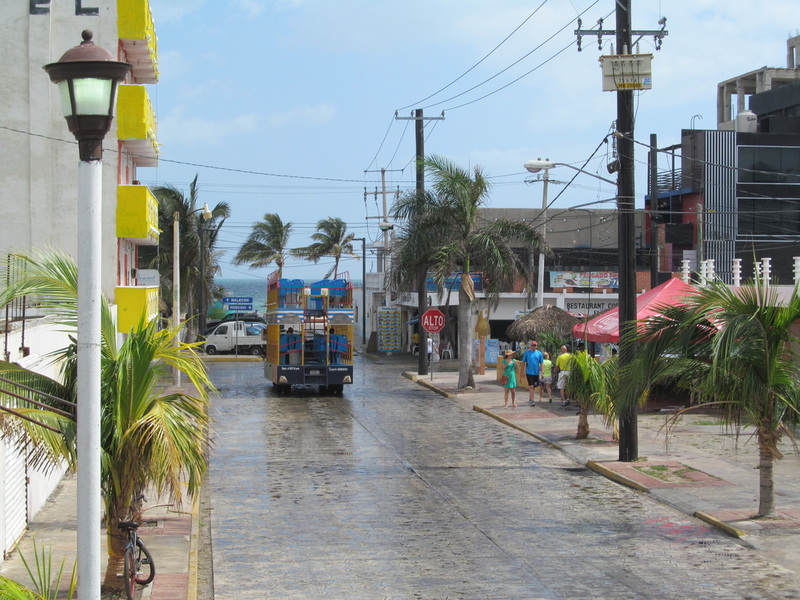 It had rained about 10 minutes prior to us getting on the bus and the bus workers wiped down the seats on the top. 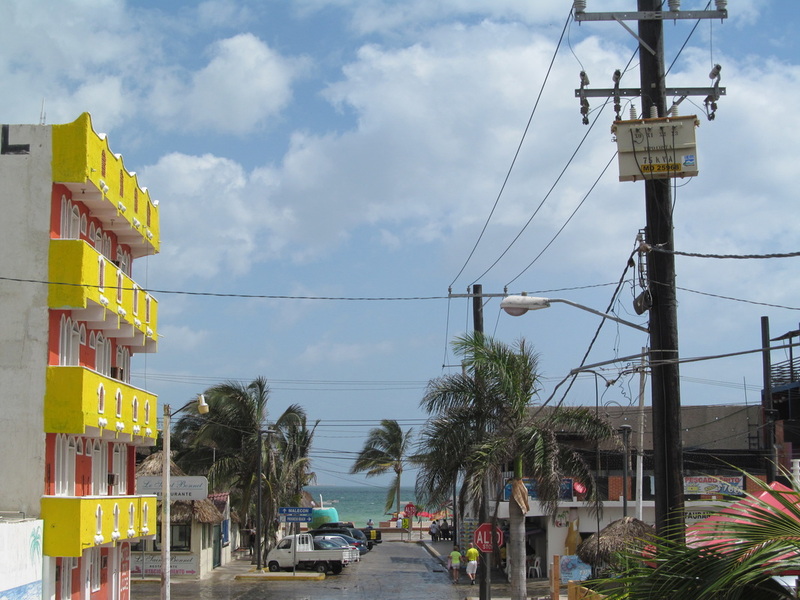 When the bus departed we were warned about low hanging powerlines. 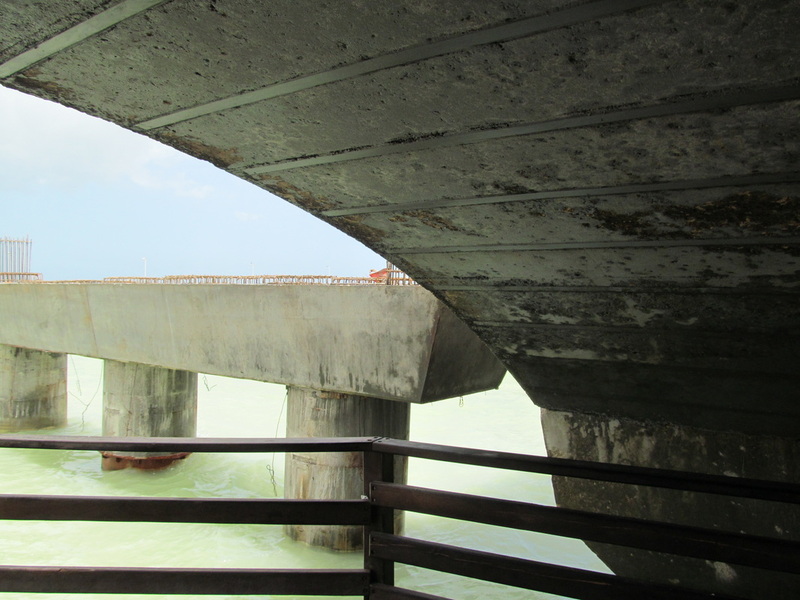 The tour guide's warning was an understatement. 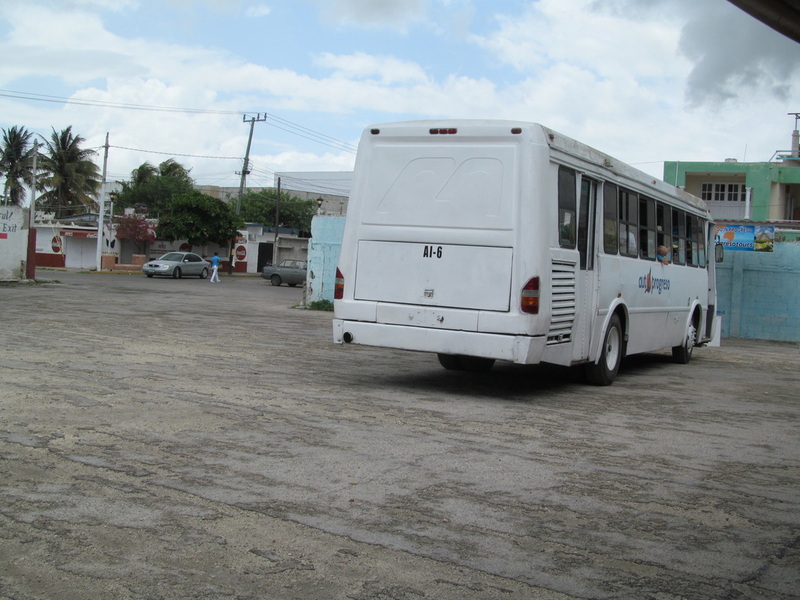 Some of the power lines nearly touched the top of the bus. 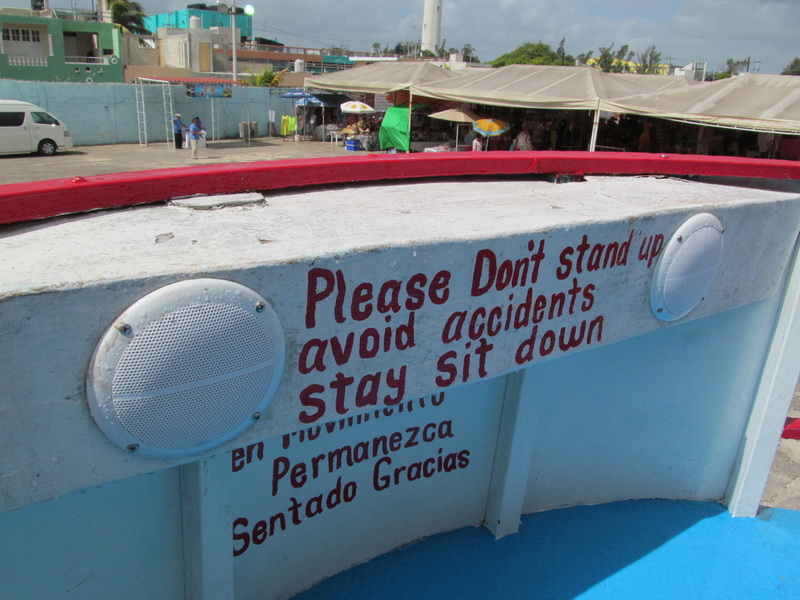 There were times when I would have to completely slump in my seat to avoid being hit by a power line. 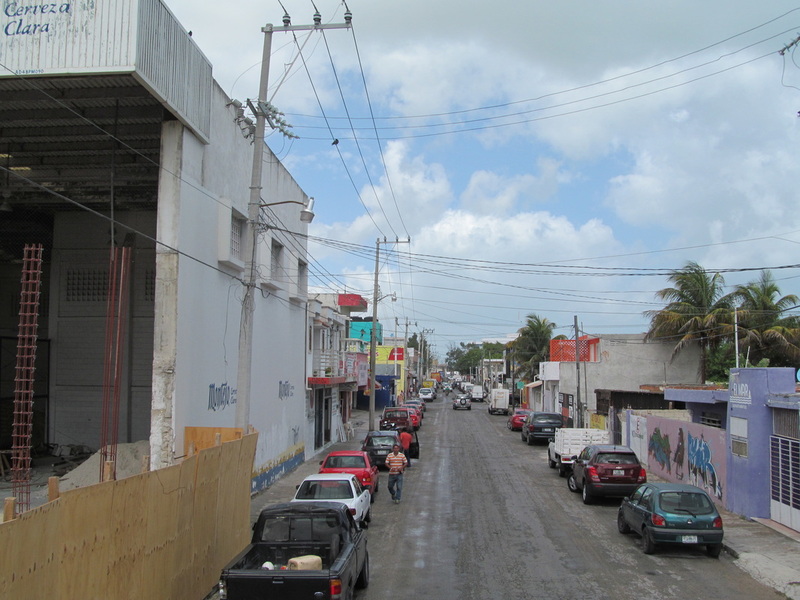 It was much needed exercise dodging power lines, but this could be tragic if someone touches the power lines. 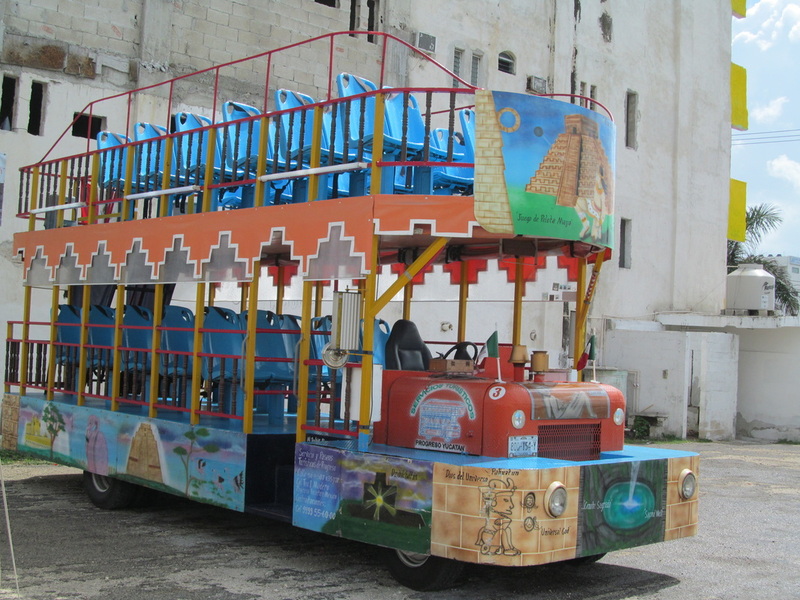 For anyone that takes this tour I recommend sitting on the bottom only for the reason of low hanging power lines. 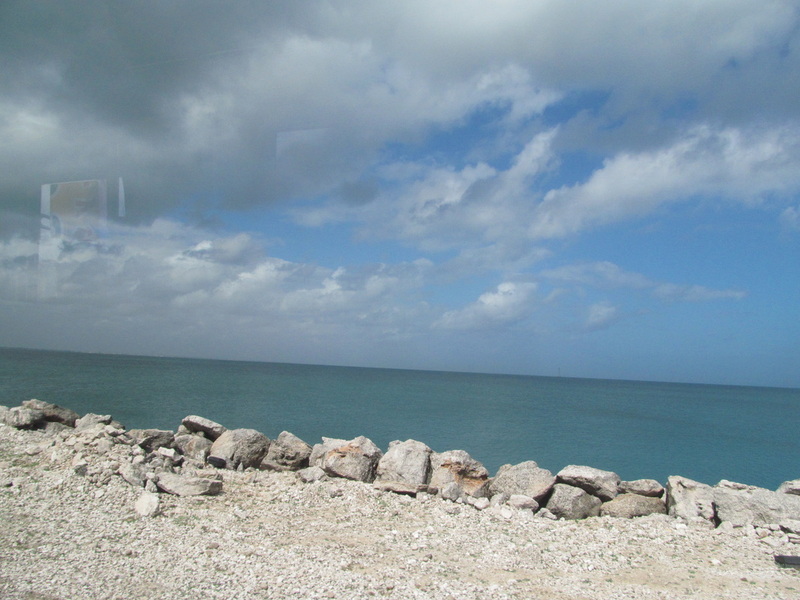 Otherwise, the best view can be found at the top of the bus! 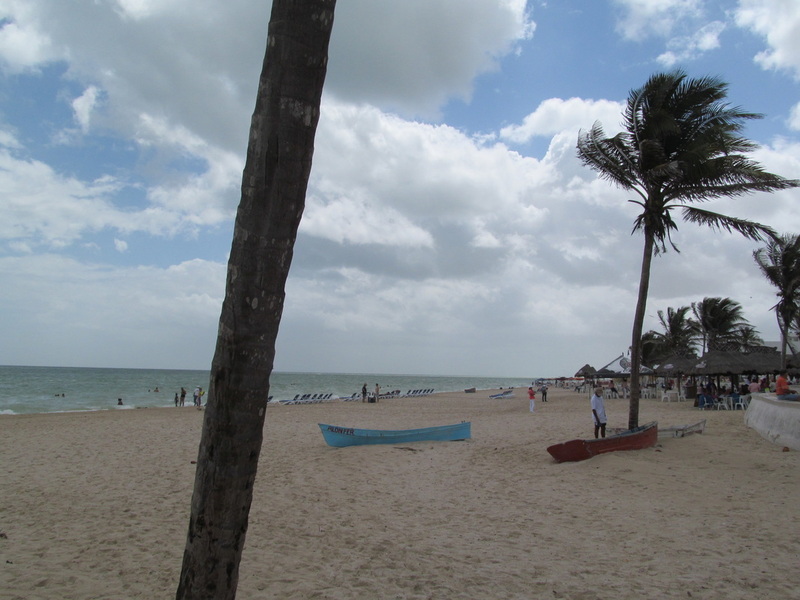 One of the places we drove by was the beach. 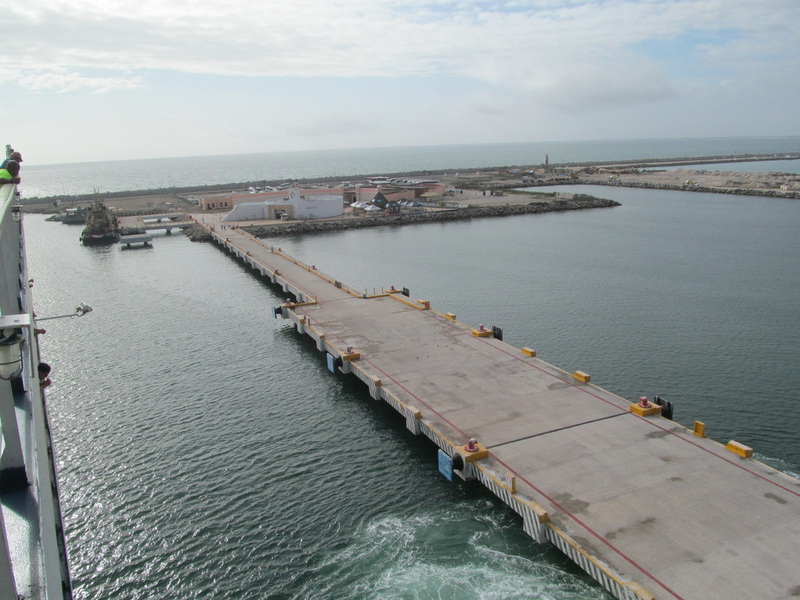 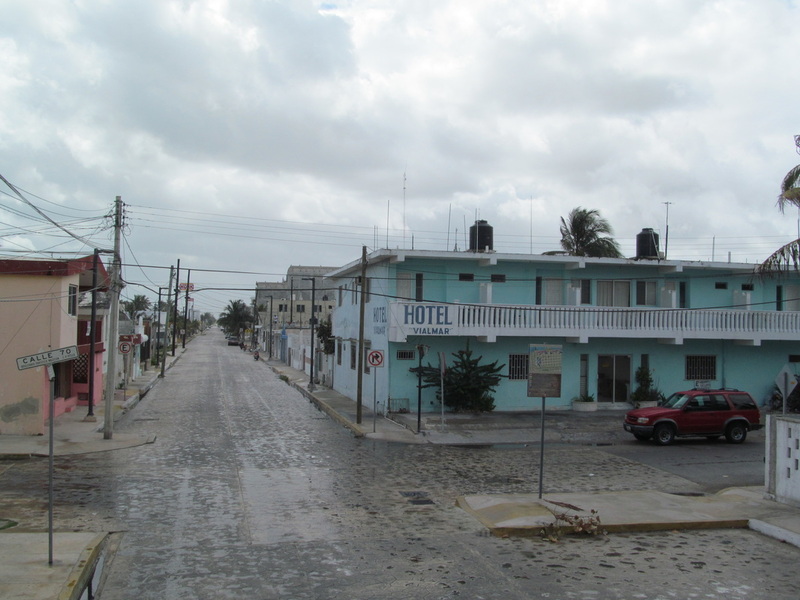 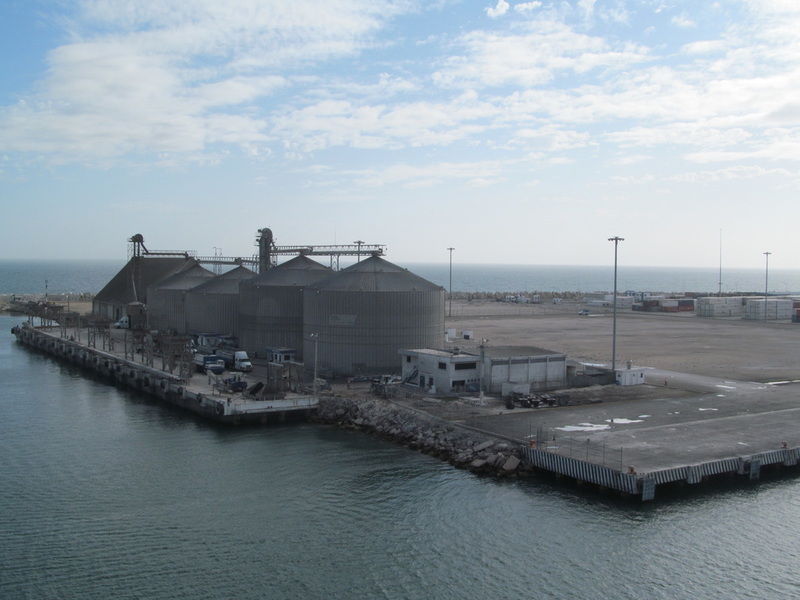 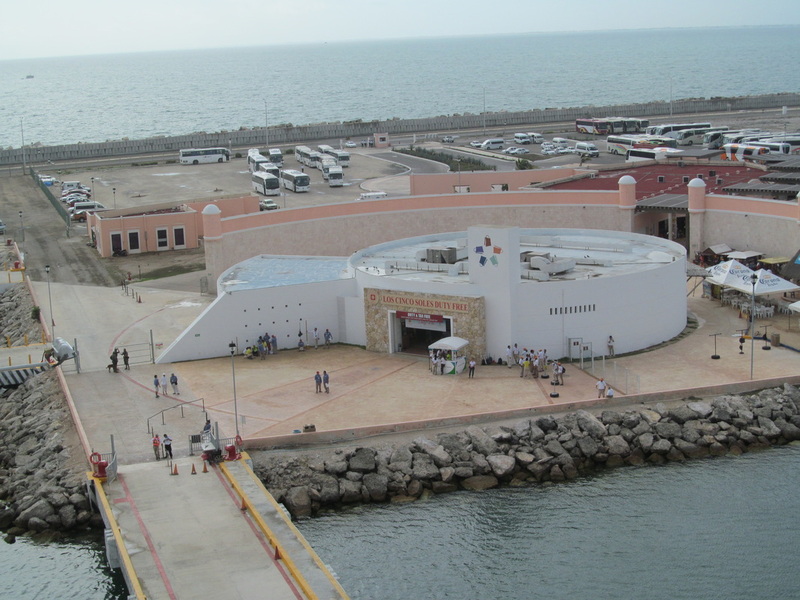 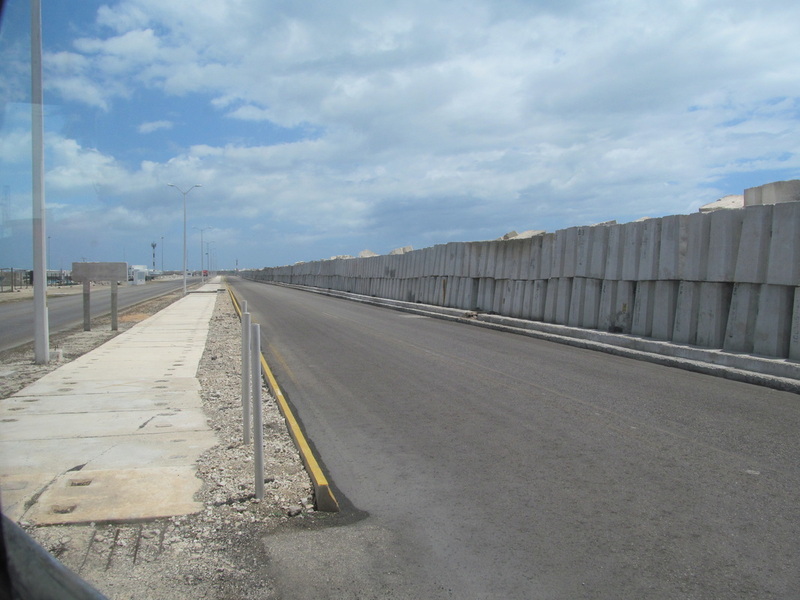 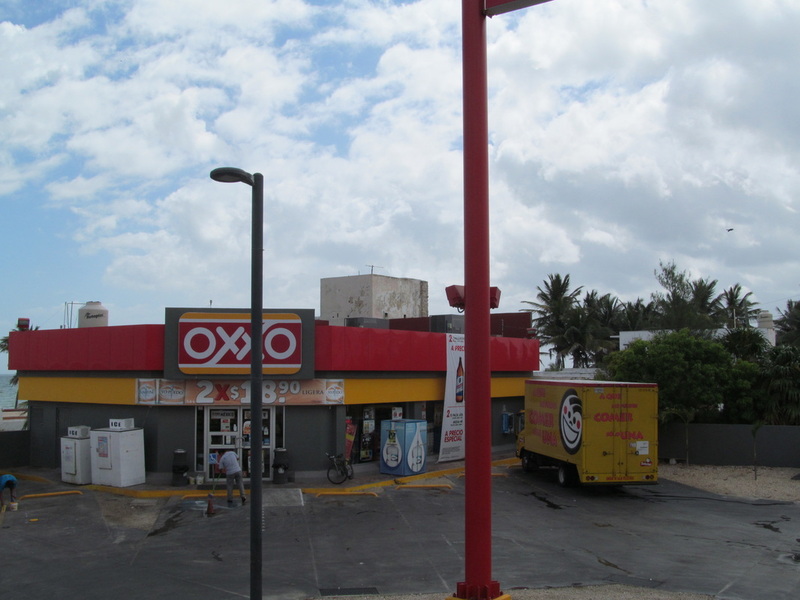 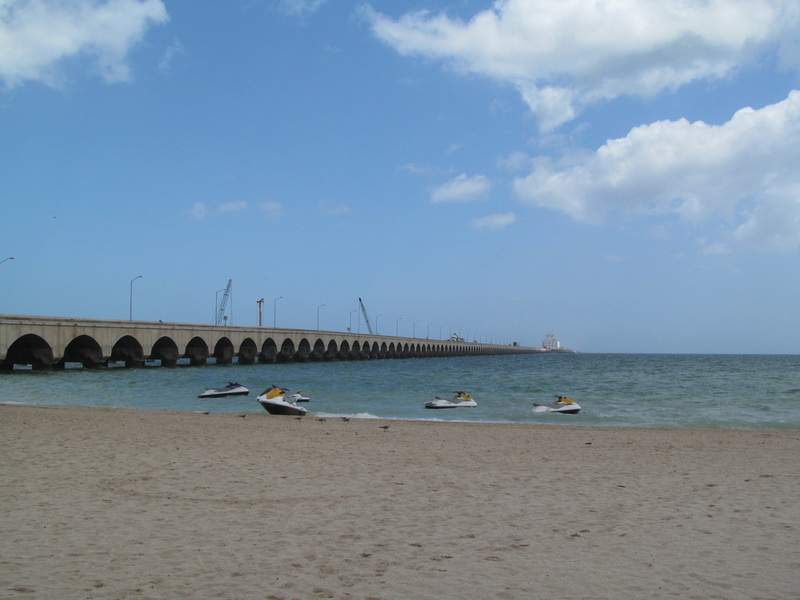 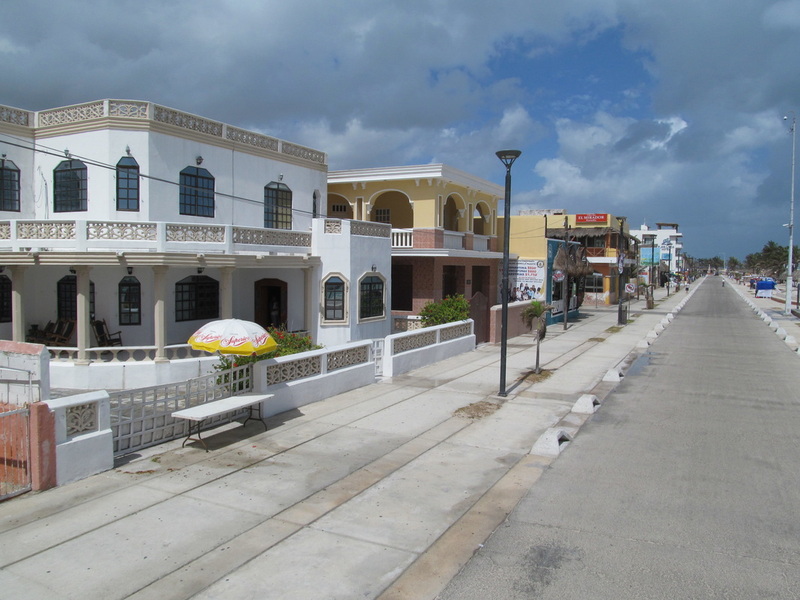 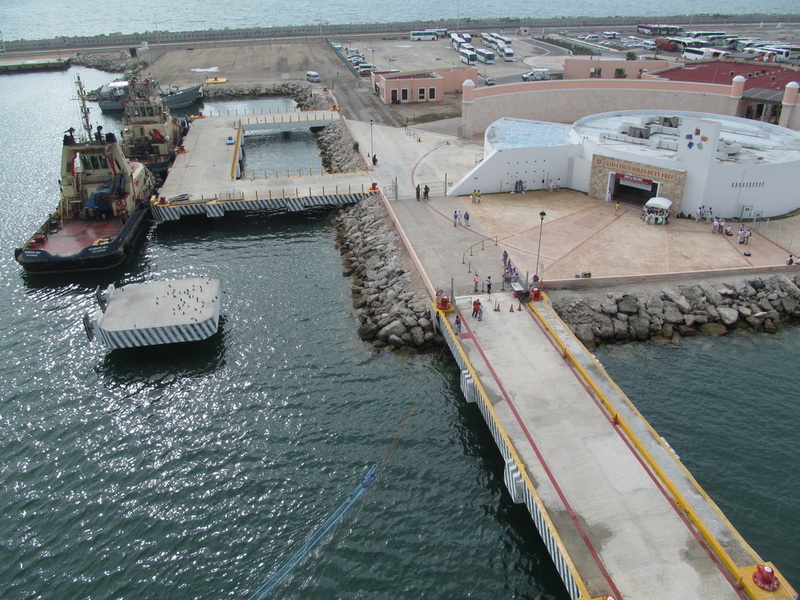 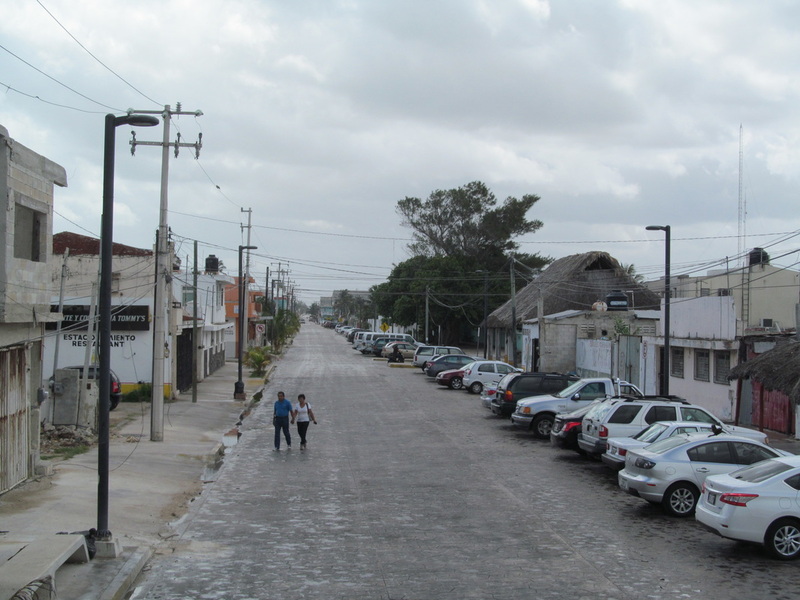 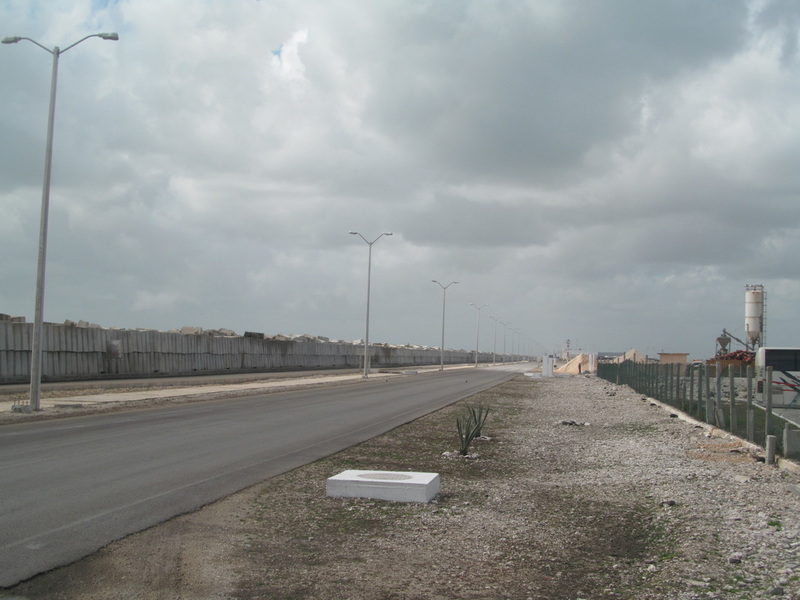 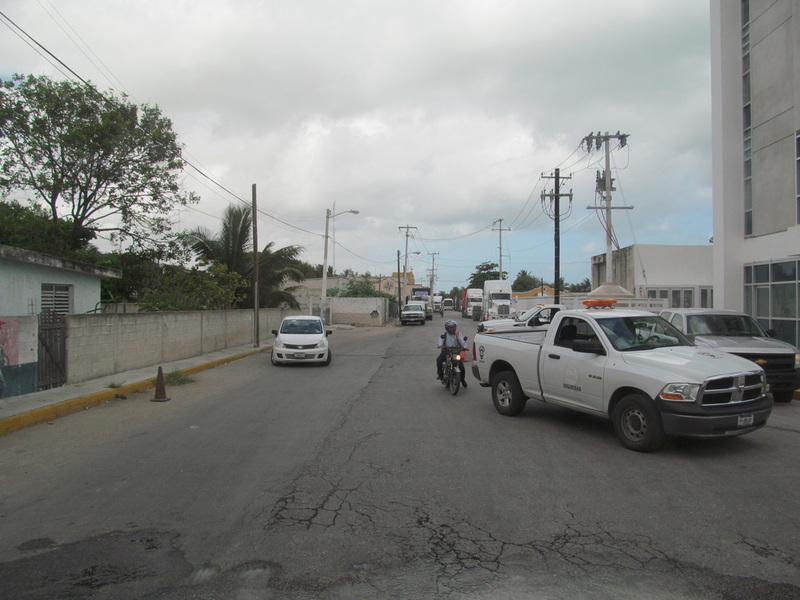 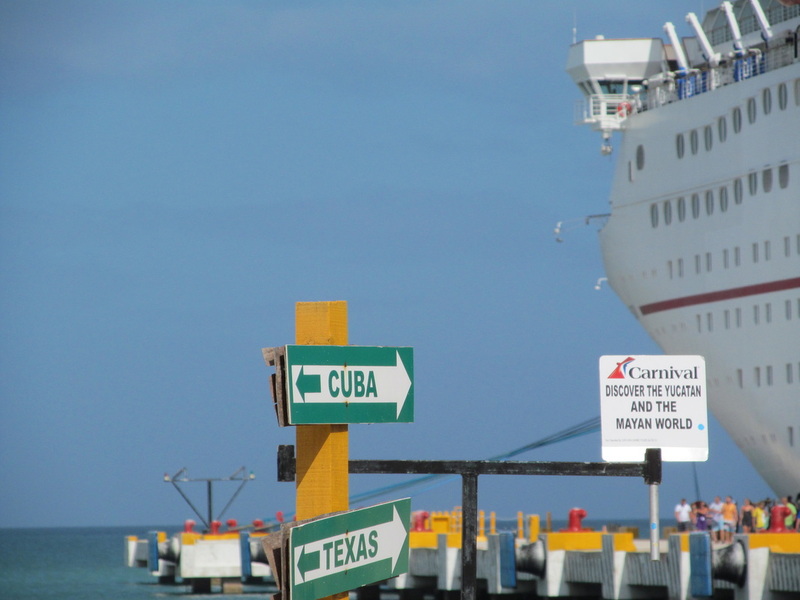 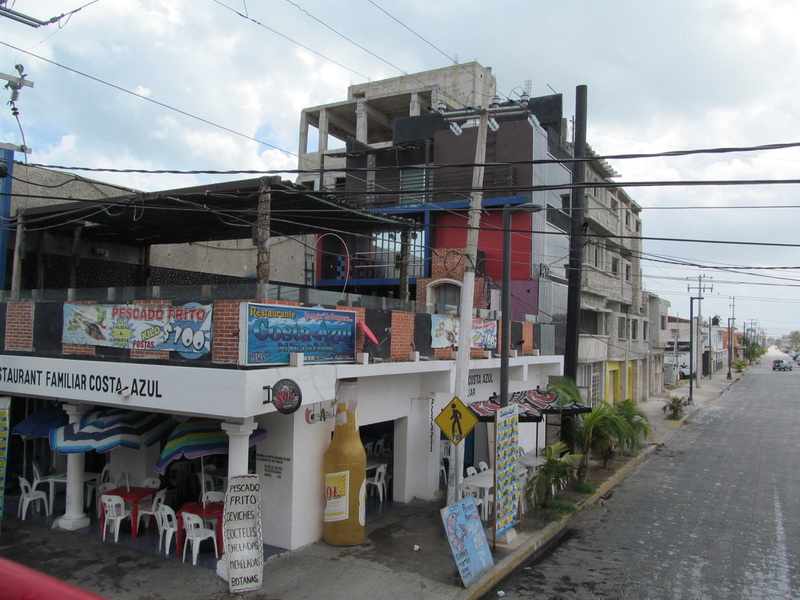 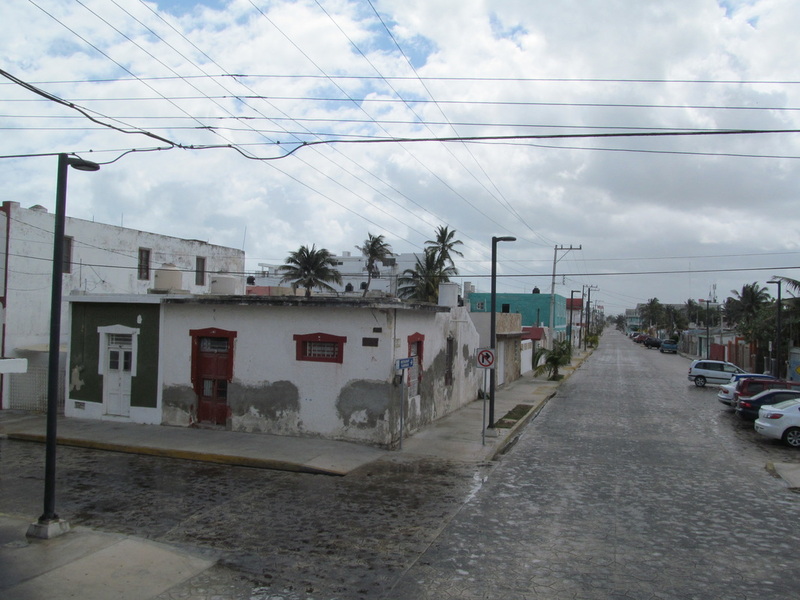 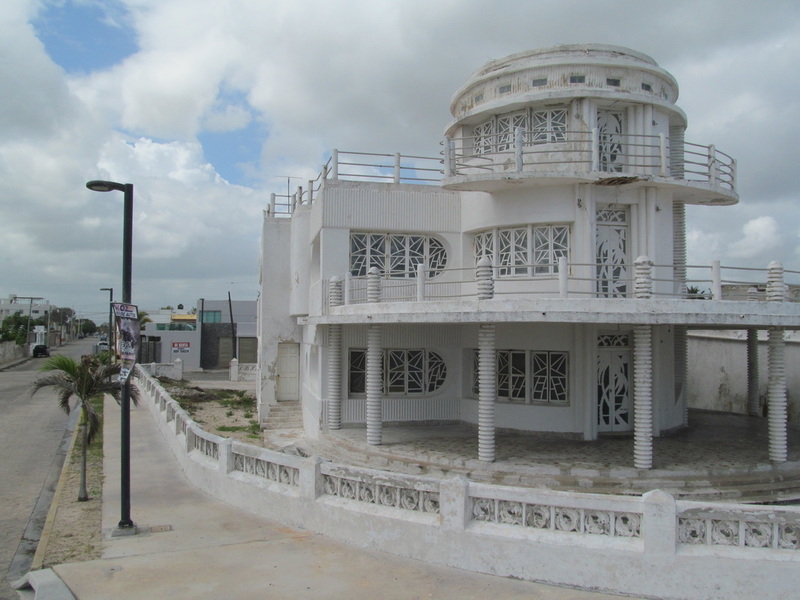 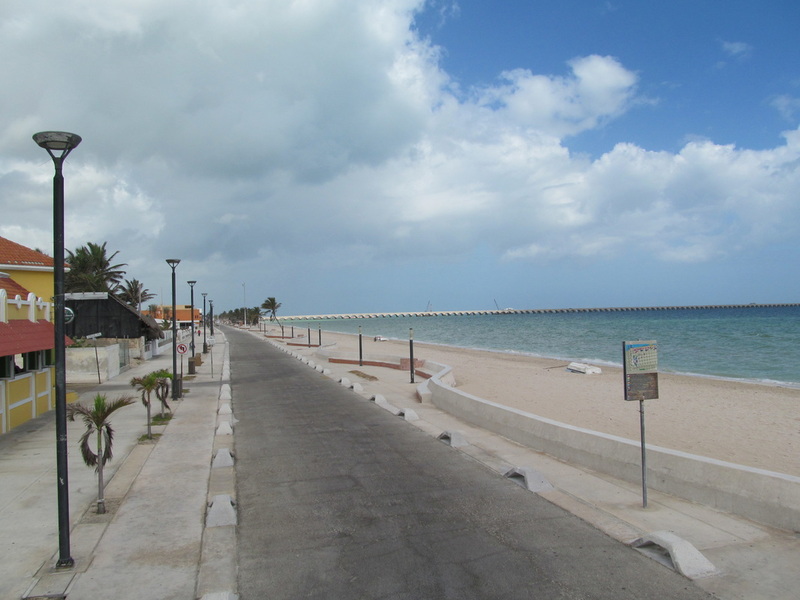 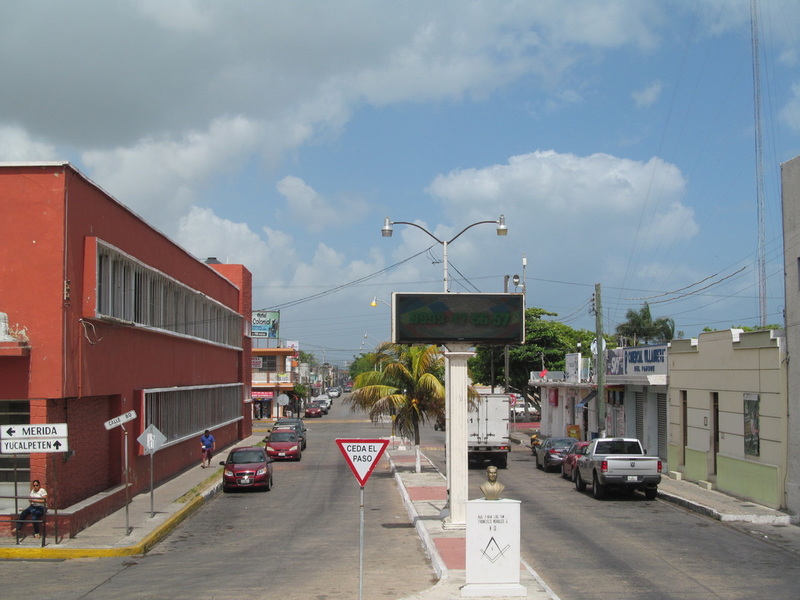 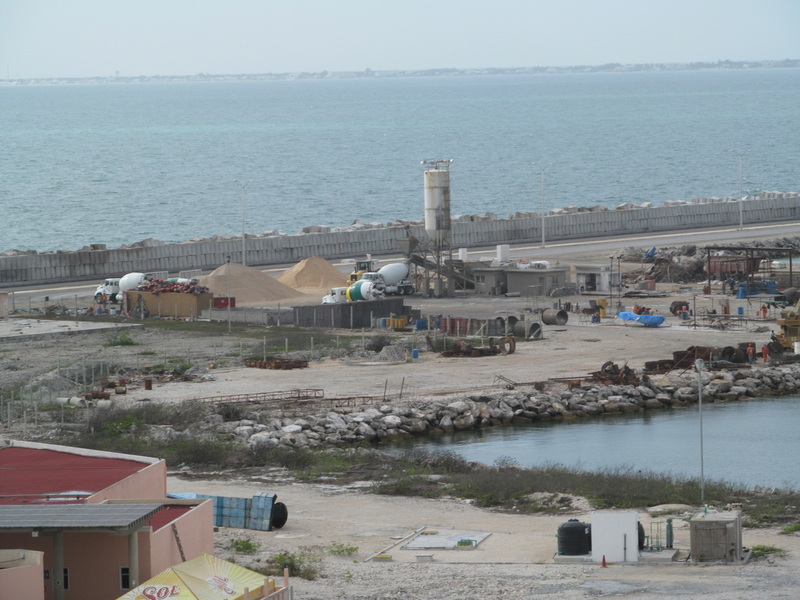 Progreso has beaches located adjacent to the roadway that goes to the cruise ship. 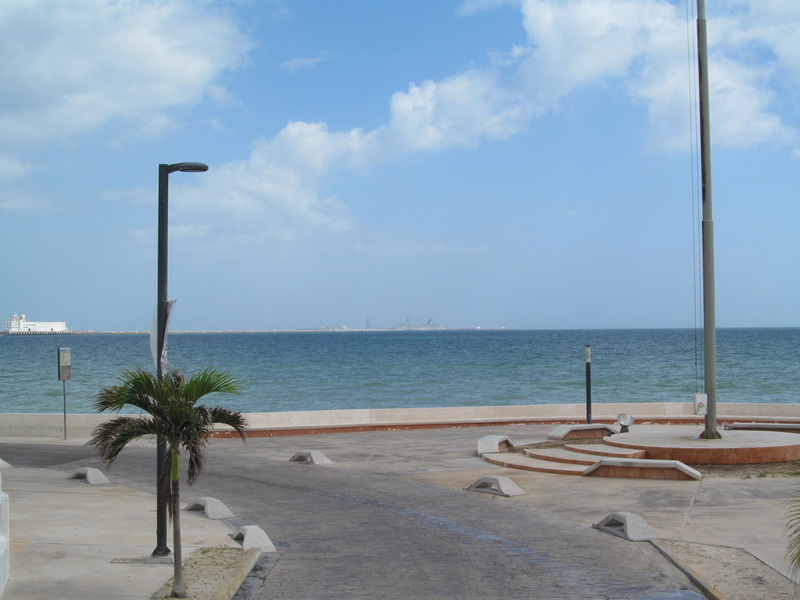 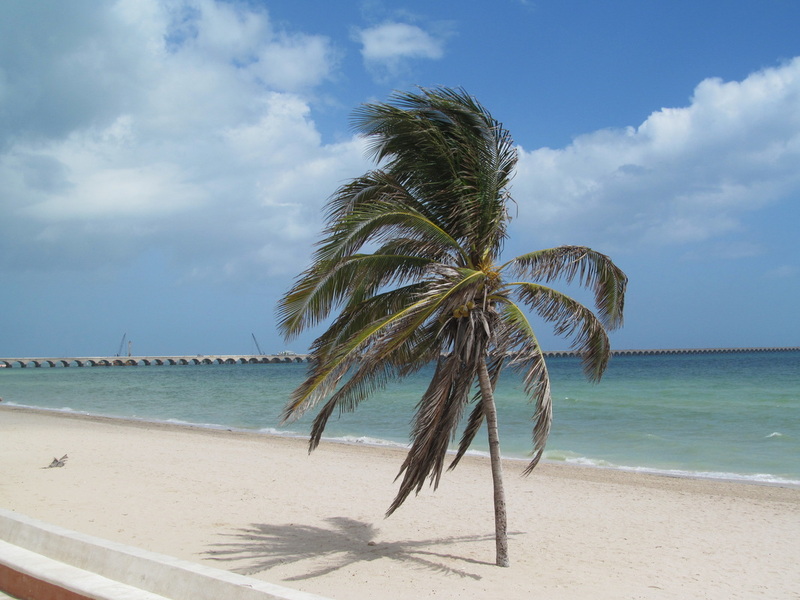 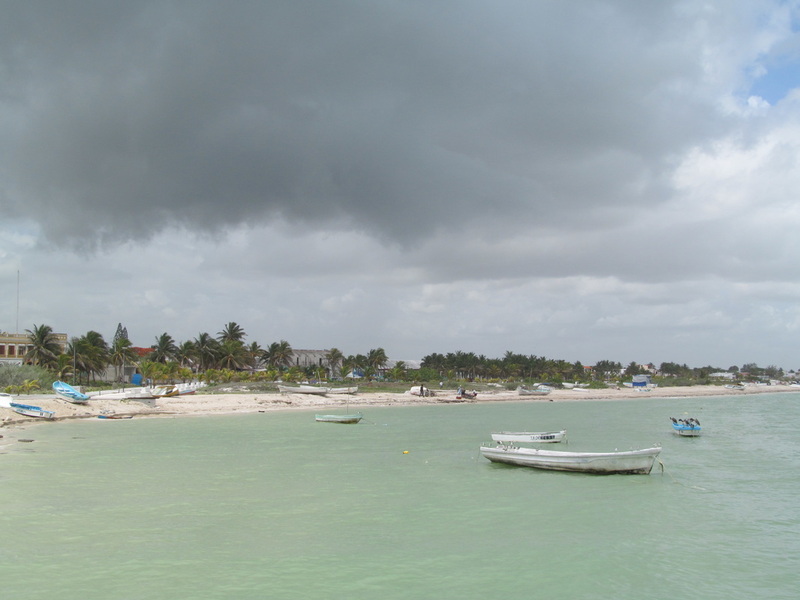 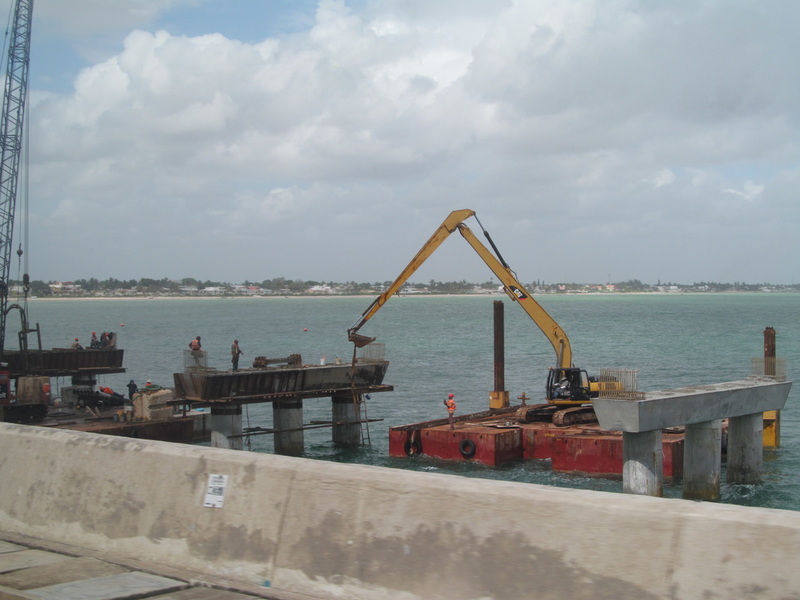 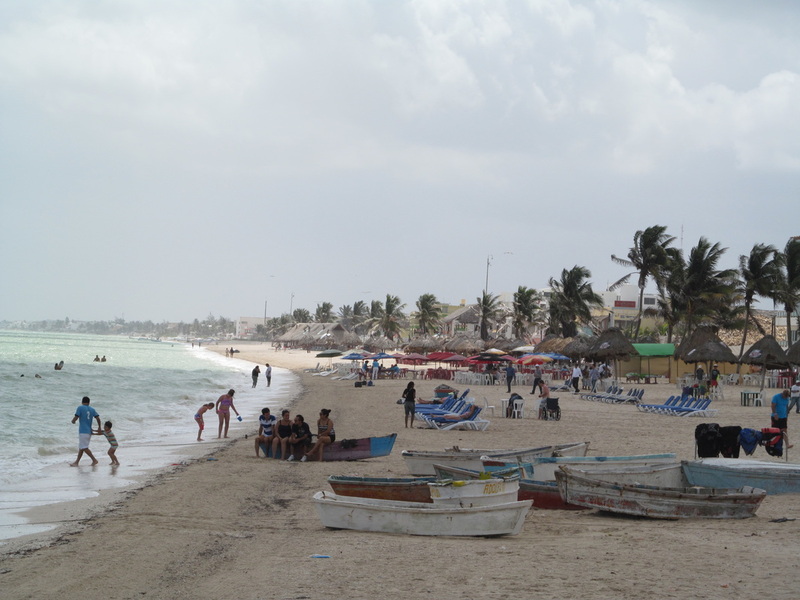 Many of the beaches located near the long pier were being used by cruise ship passengers and other tourists visiting Progreso. 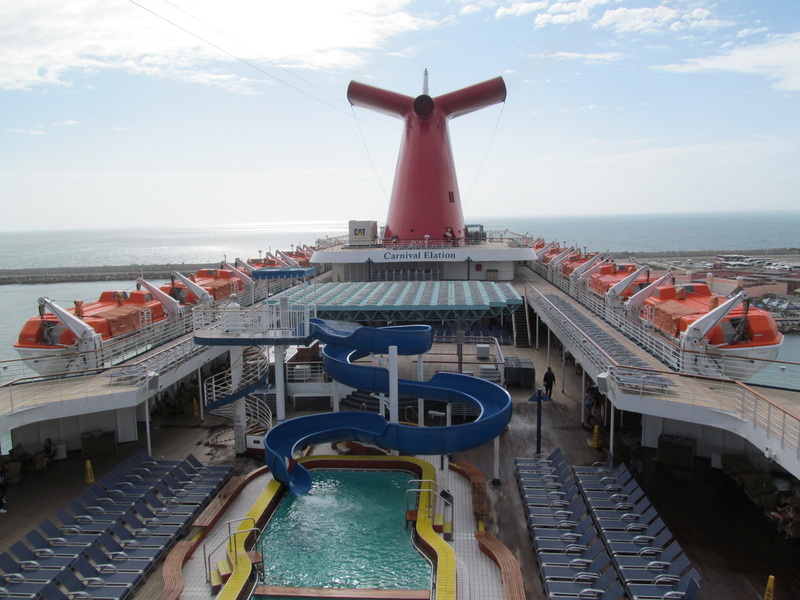 The water here is definitely nicer than the water in the Mississippi River or the Texas Coast. 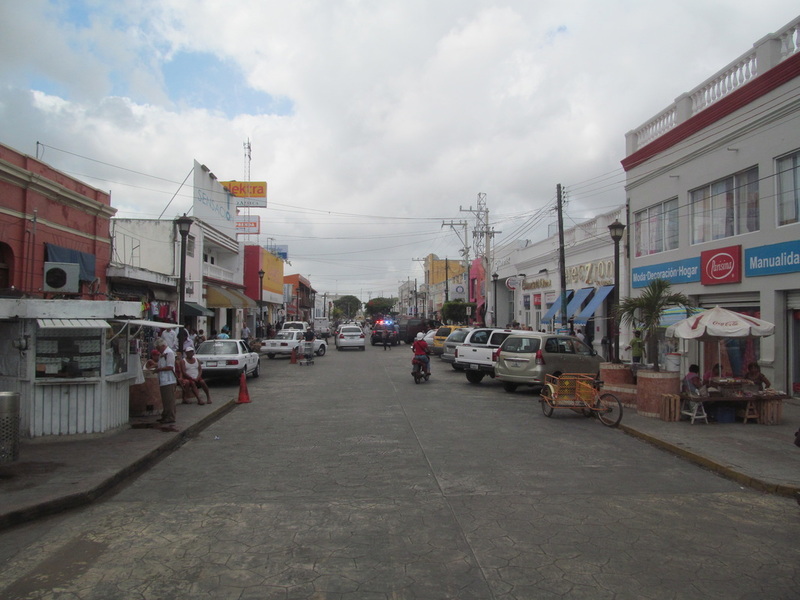 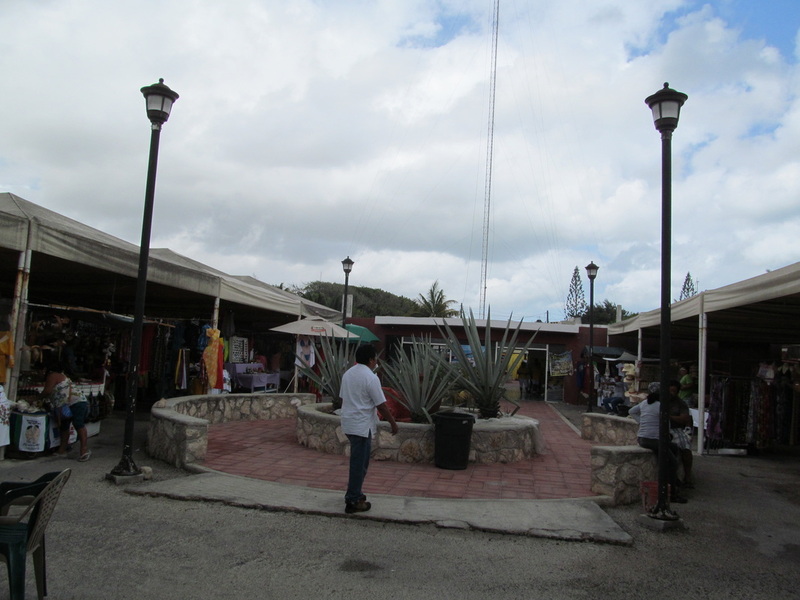 After driving away from the beach we were taken into the town square area. 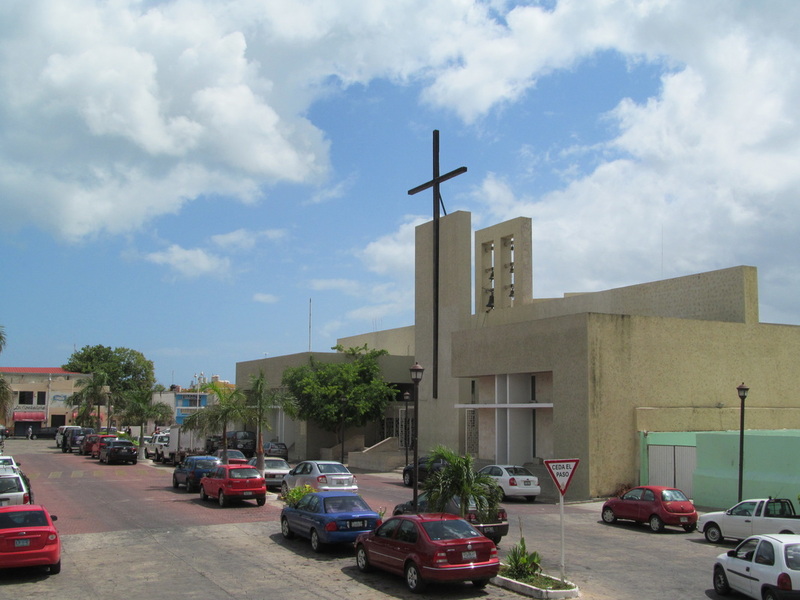 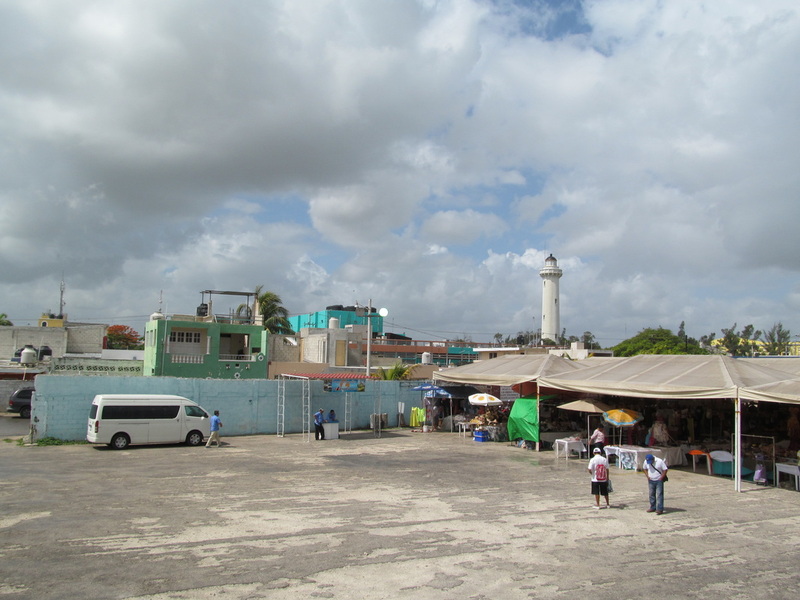 This area has local government offices, many businesses, as well as a church. 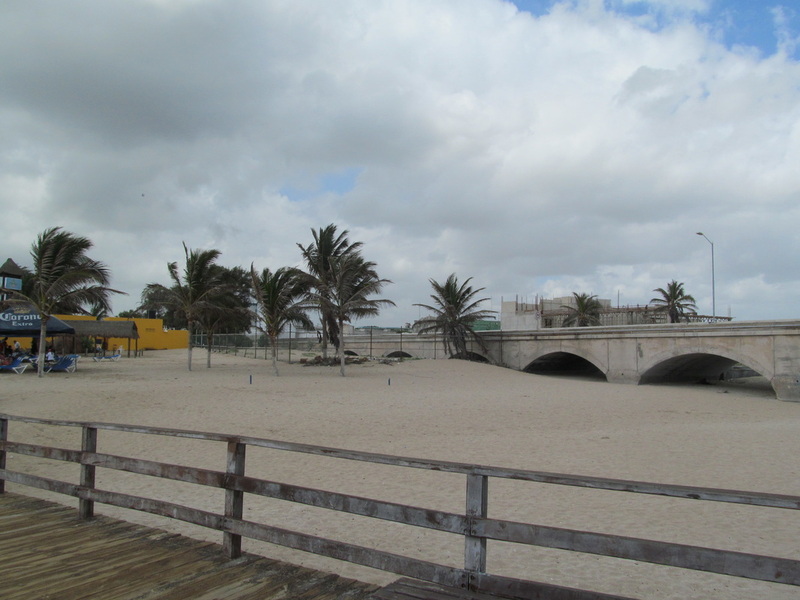 After seeing the beach on our bus ride around the city, we decided to go check it out for ourselves. 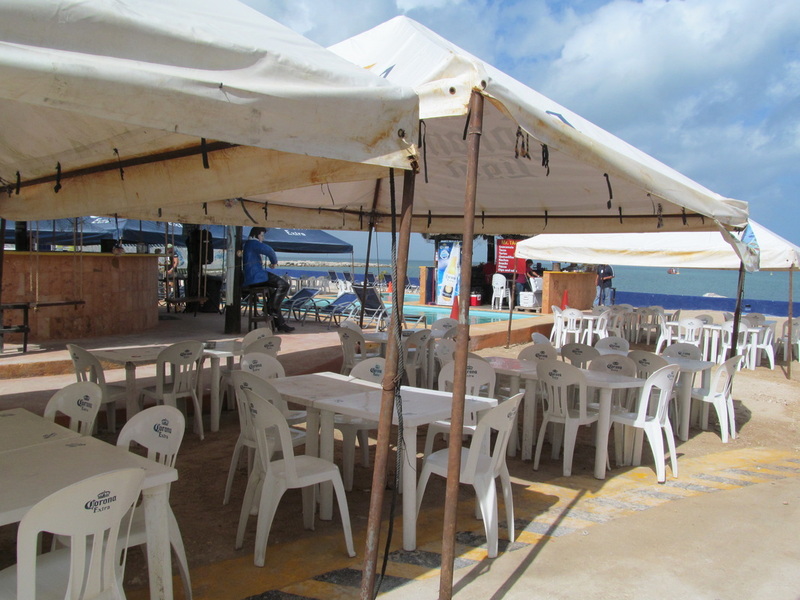 Using the beach is free, but there are many chairs and tables tourists can rent. 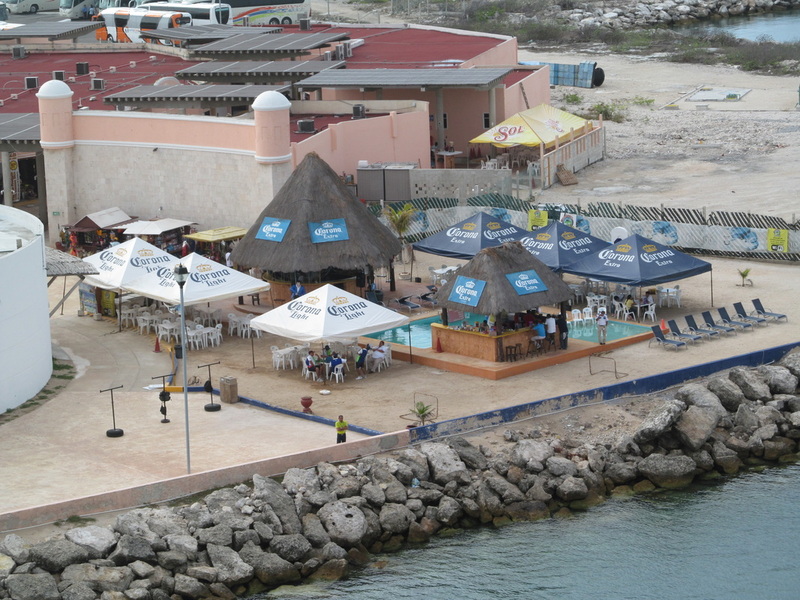 There is also a bar and restaurant along the beach too. 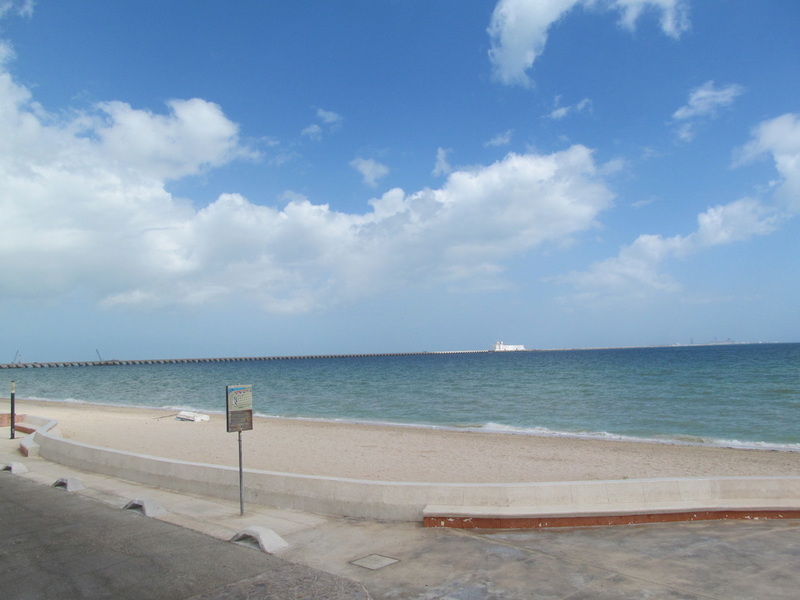 We visited the part of the beach that is close to the long pier that would take us back to the Carnival Elation. 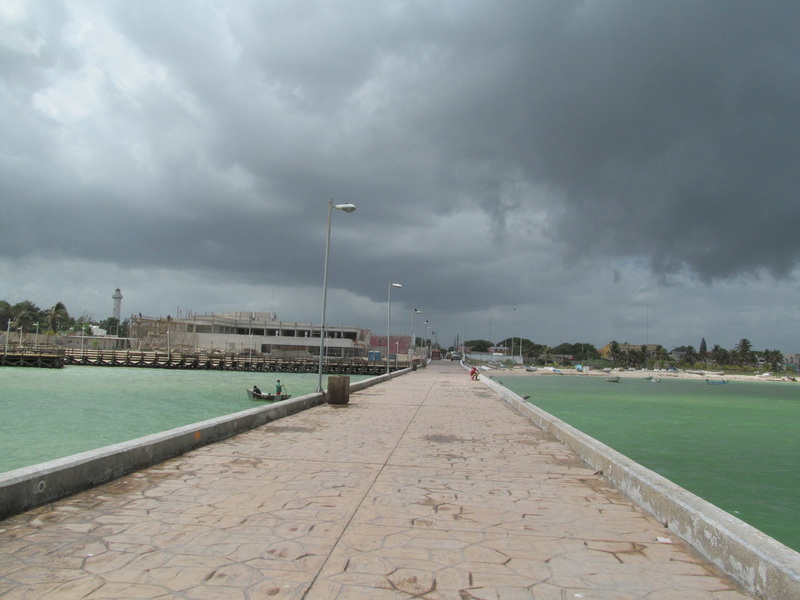 It was neat looking down the pier because it very long. 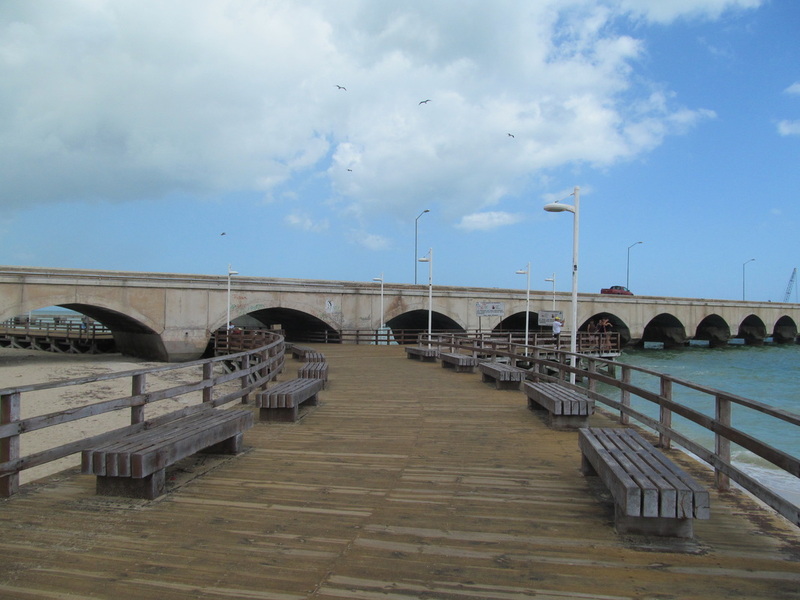 There is a wooden walkway you can use to walk under the pier to get to the other side's beaches. 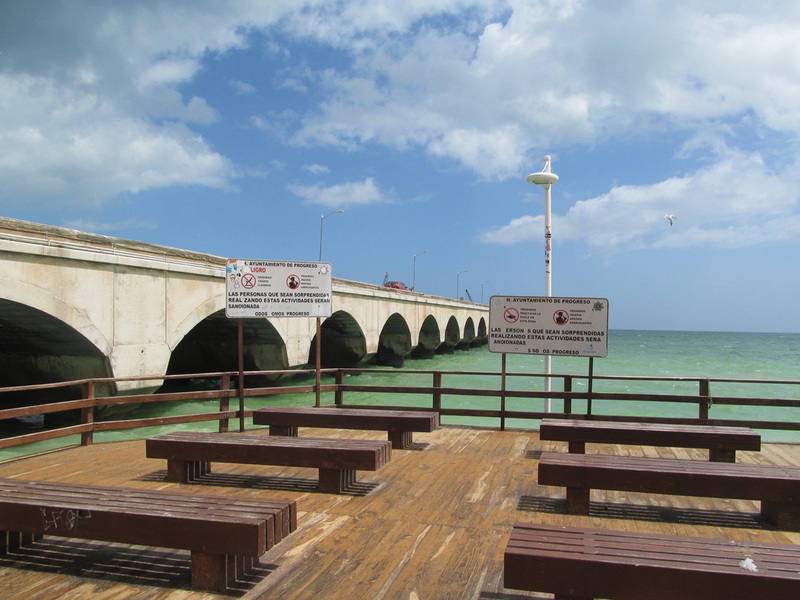 The middle picture on the row below was taken under the pier from the wooden walkway. 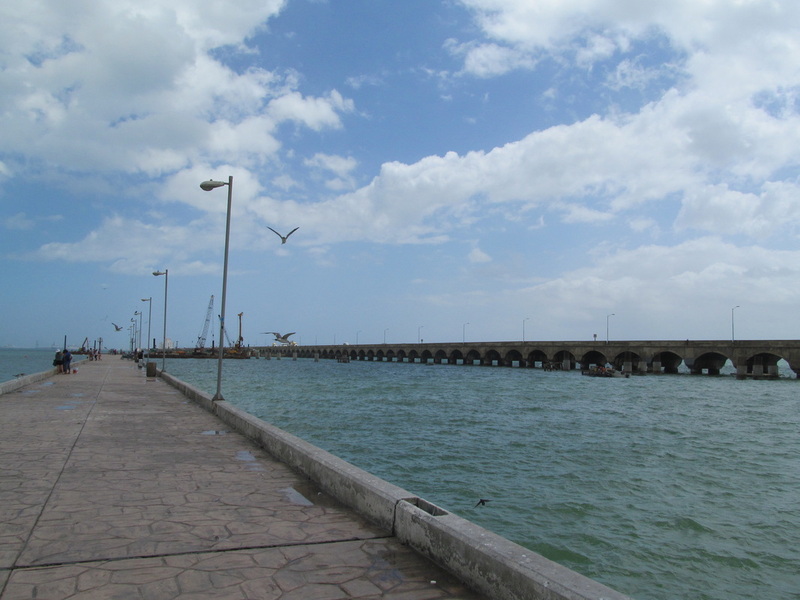 On the other side of the pier was another beach area, but also a small pier being used for fishing. 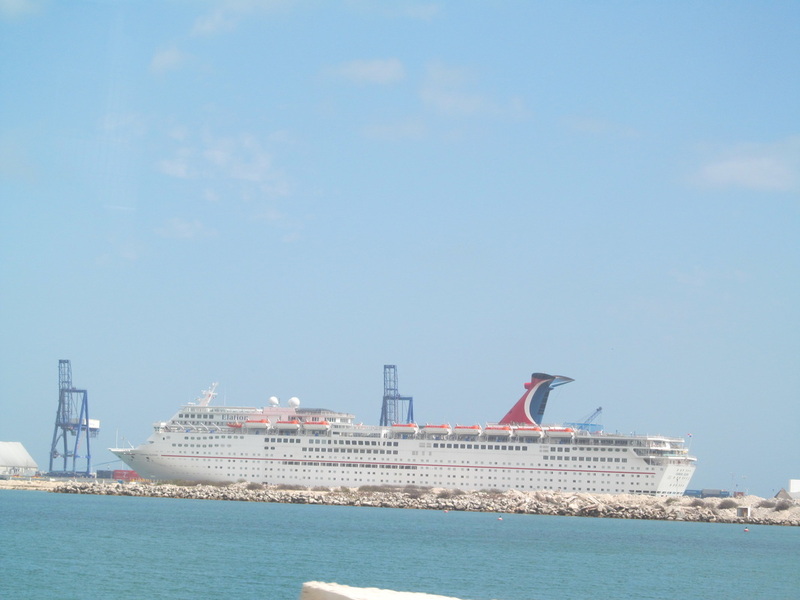 This pier was free to walk down and I walked to the end to zoom in on the cruise ships. 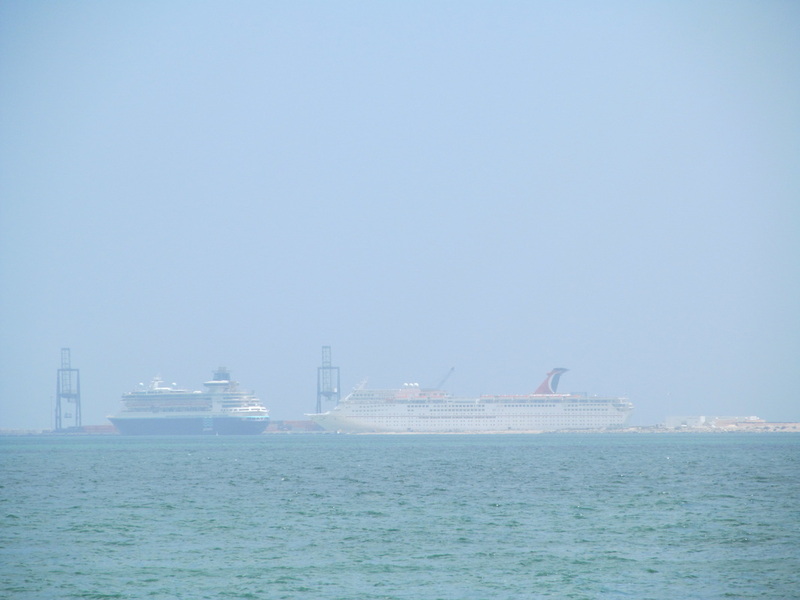 The Pullmantur Monarch was pulling in next to the Carnival Elation. 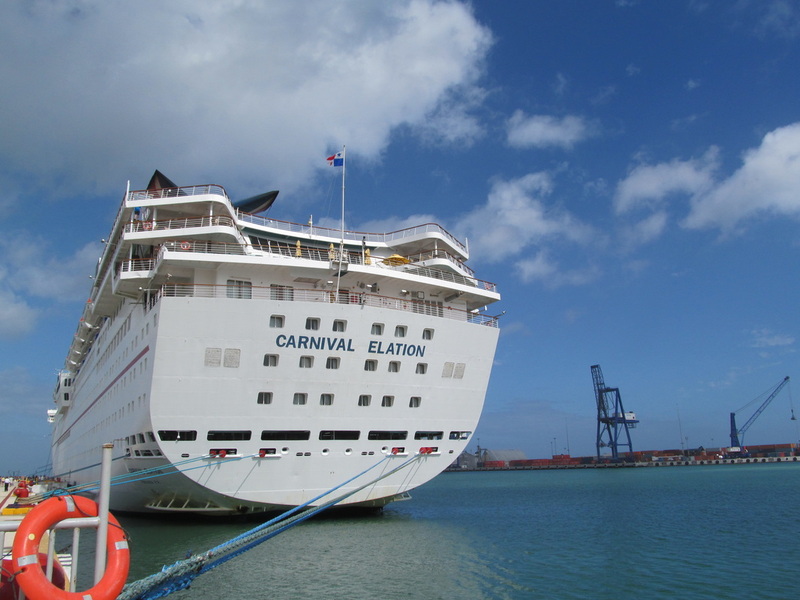 After spending some time around the beach, it was time to head back to the Carnival Elation for lunch. 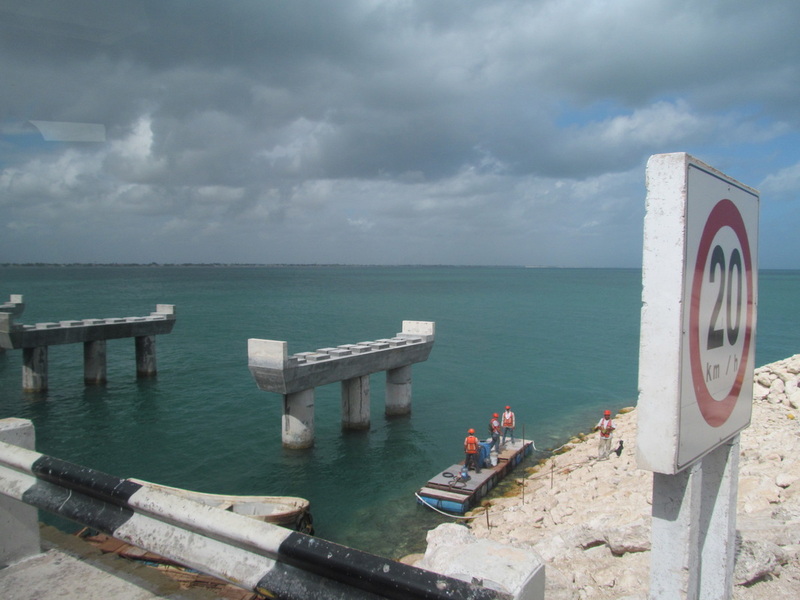 We were lucky and were able to board a stopped shuttle bus. 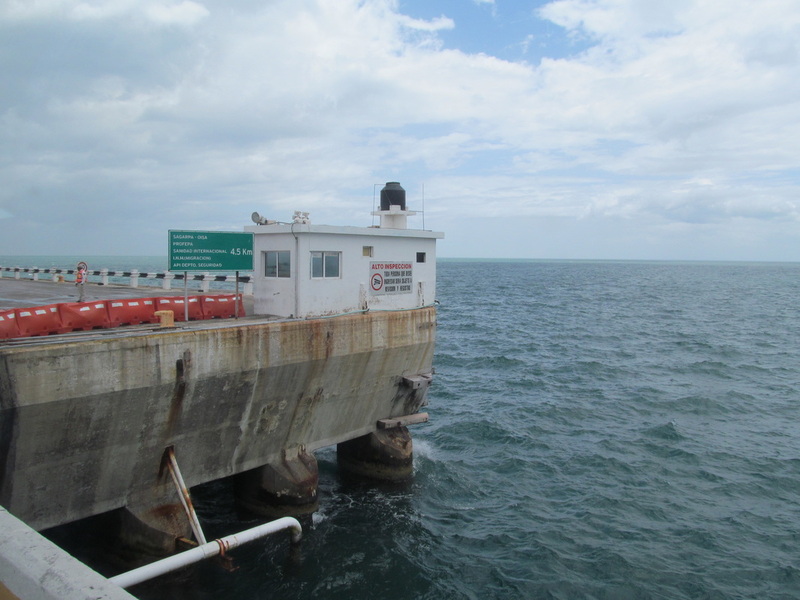 The ride was quick because the driver drove at a moderate speed. 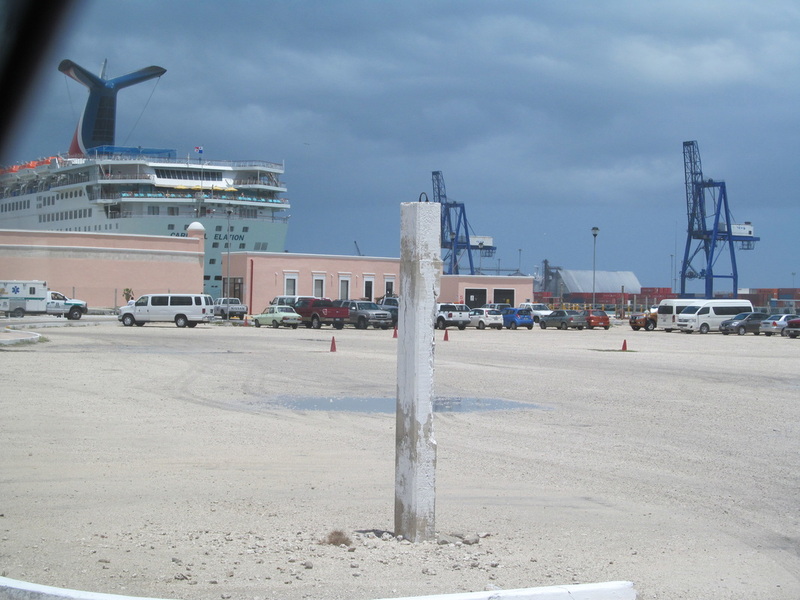 The ride took no more than ten minutes and once we were back at the cruise ship terminal area we had to walk back through the shops in order to get to the ship. 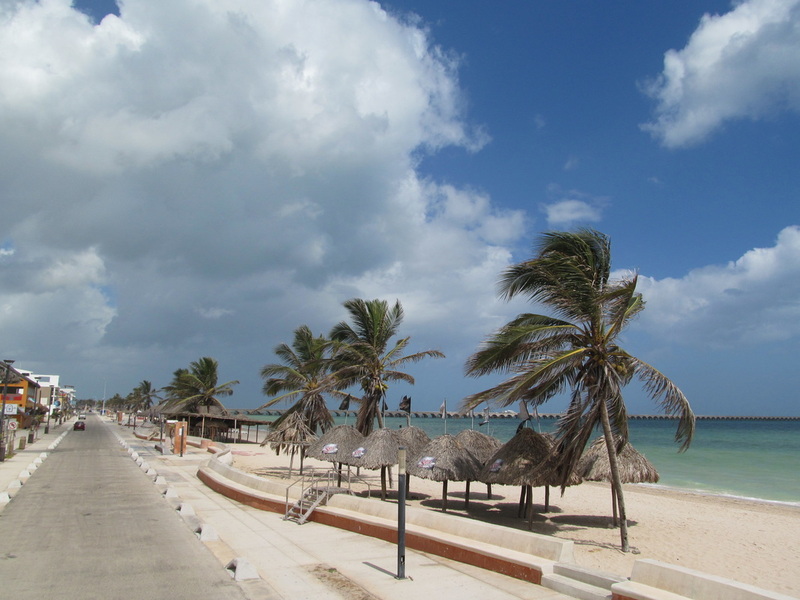 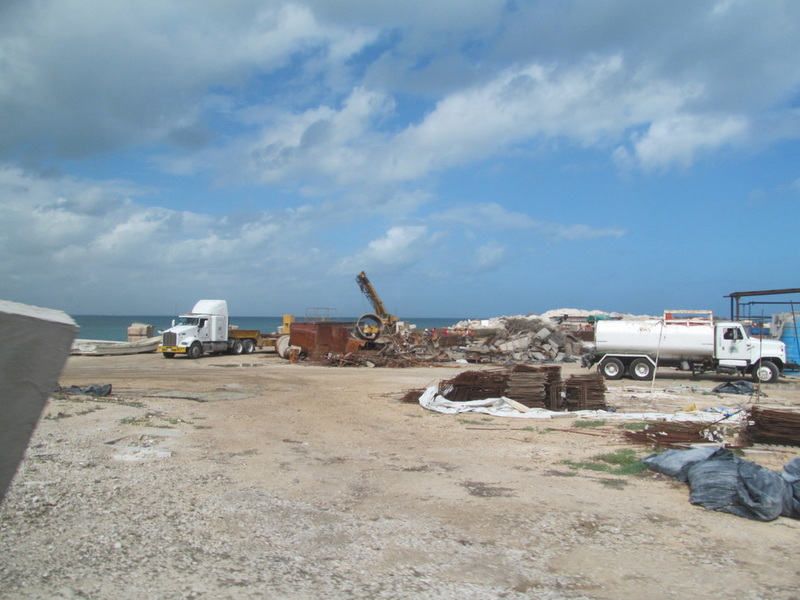 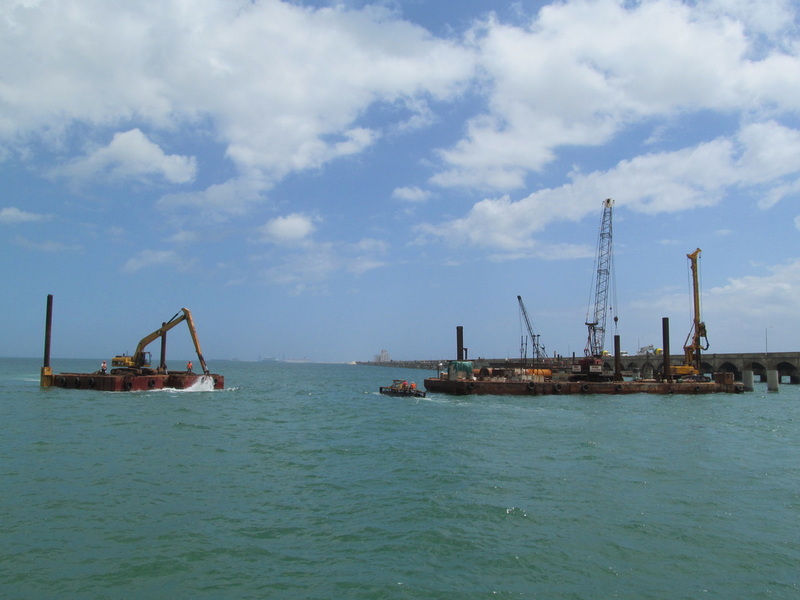 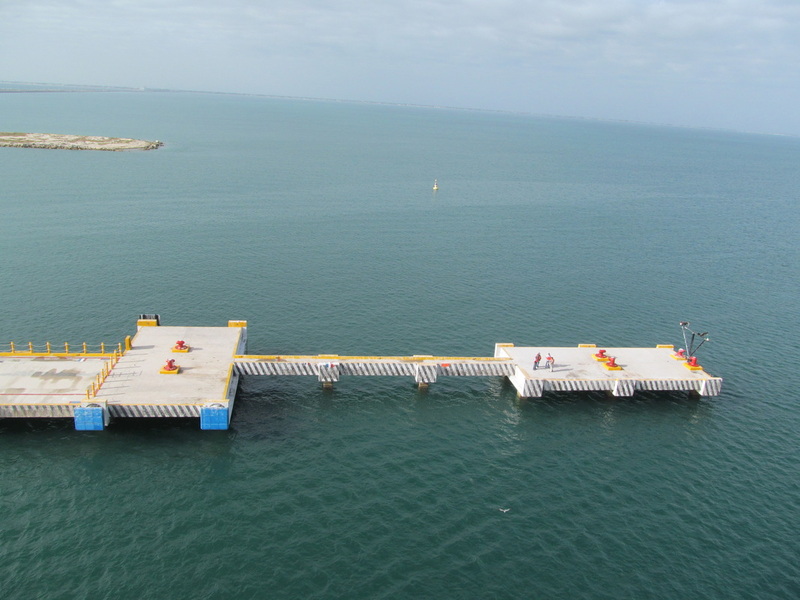 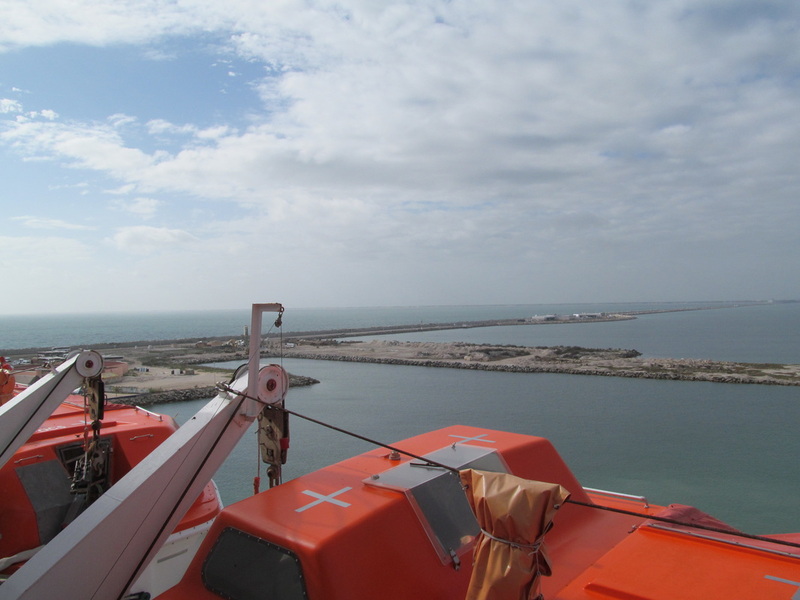 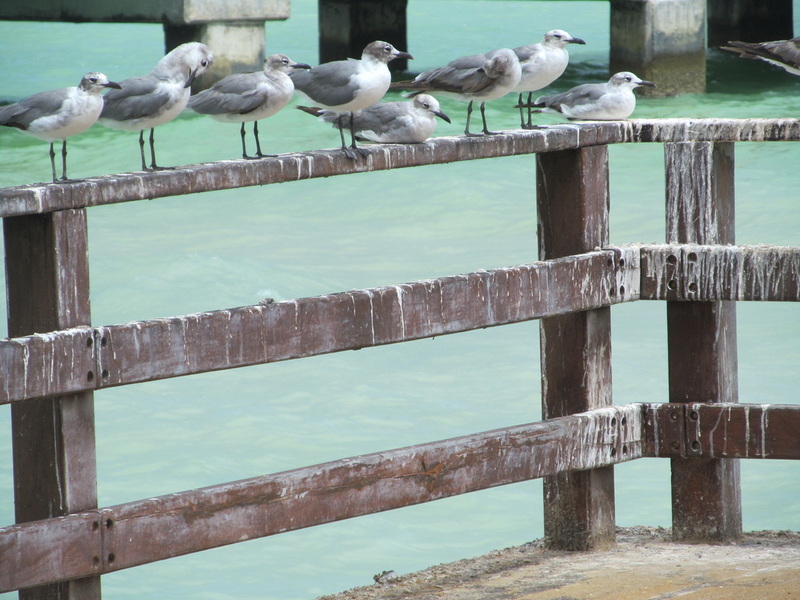 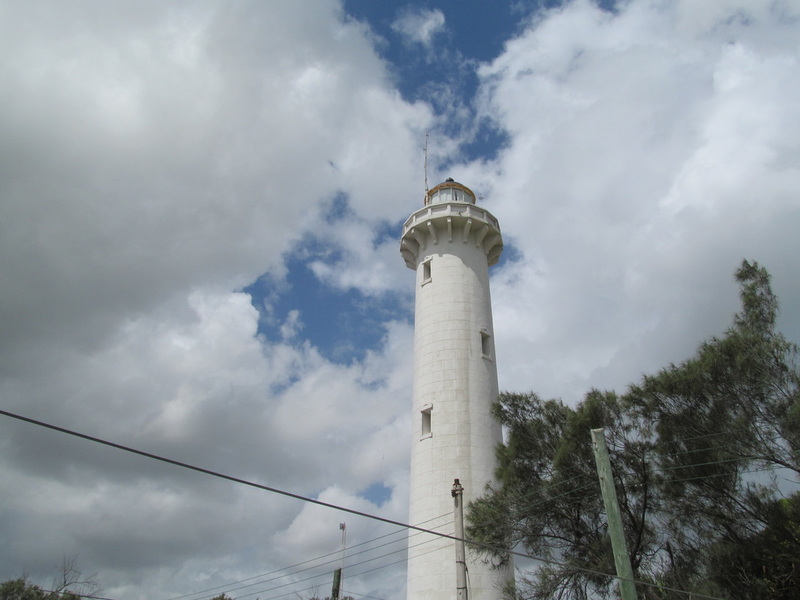 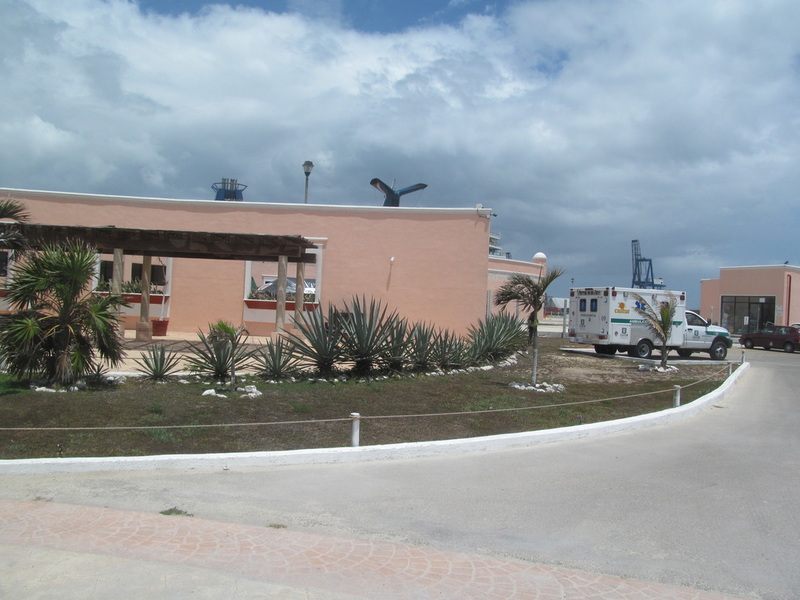 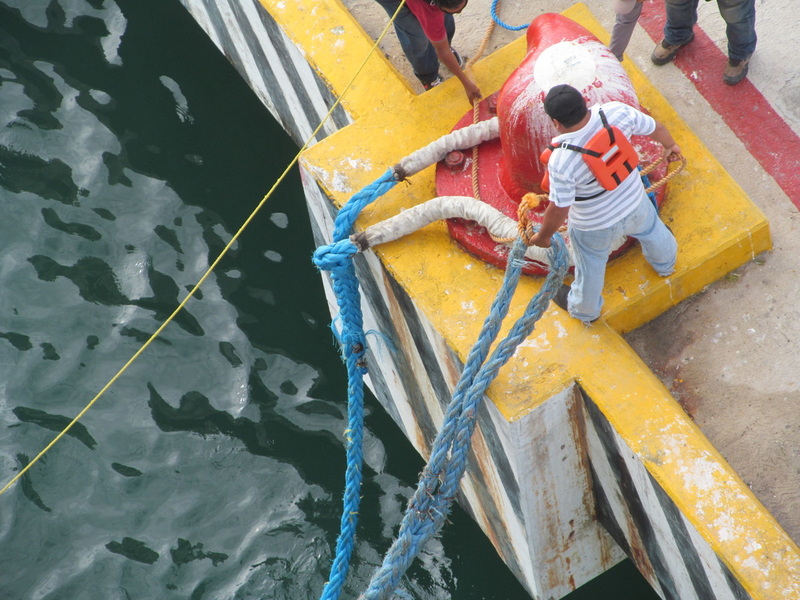 Continue To 2nd Part Of My Progreso Day's Review!